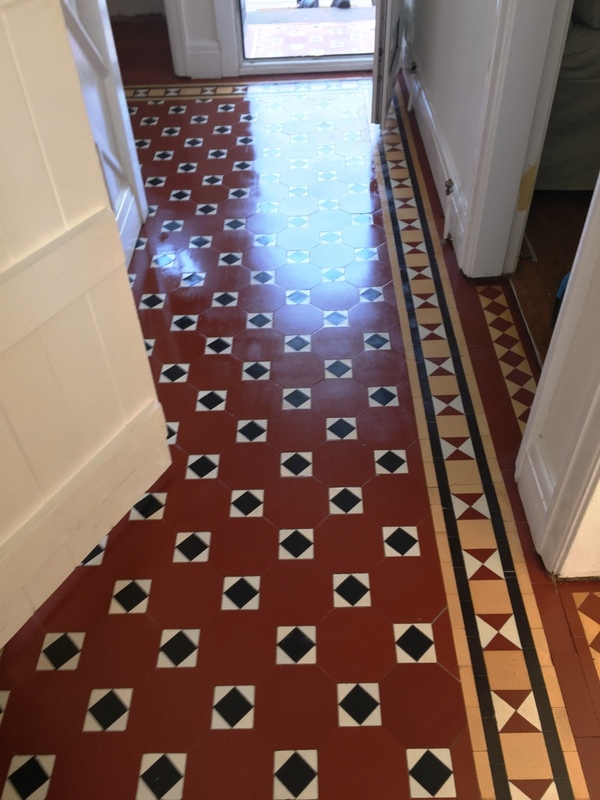 I was very pleased to be contacted by this client, they lived on a lovely residential road near the centre of Rugby in Warwickshire and the house featured a beautiful Victorian tiled hallway floor. As you will see from the pictures the patterns are stunning. 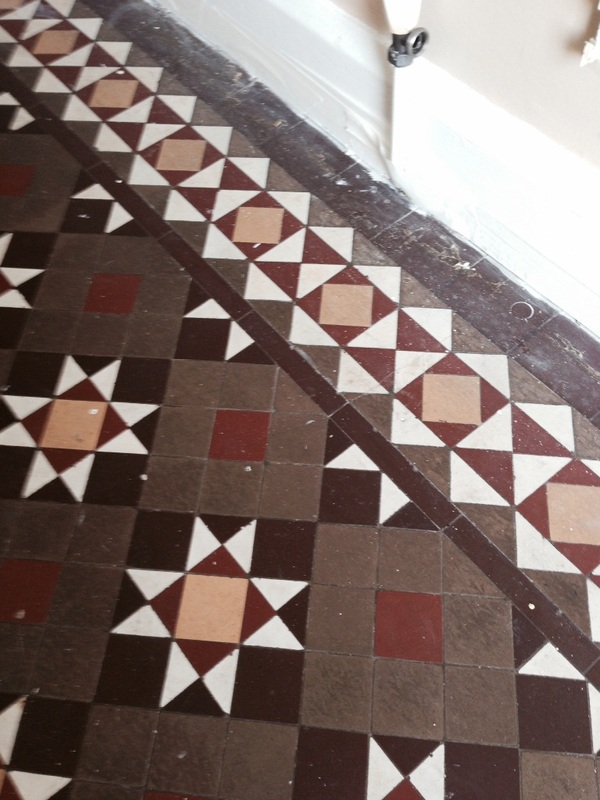 Over the years it had been badly damaged along the edges and a few tiles were cracked. 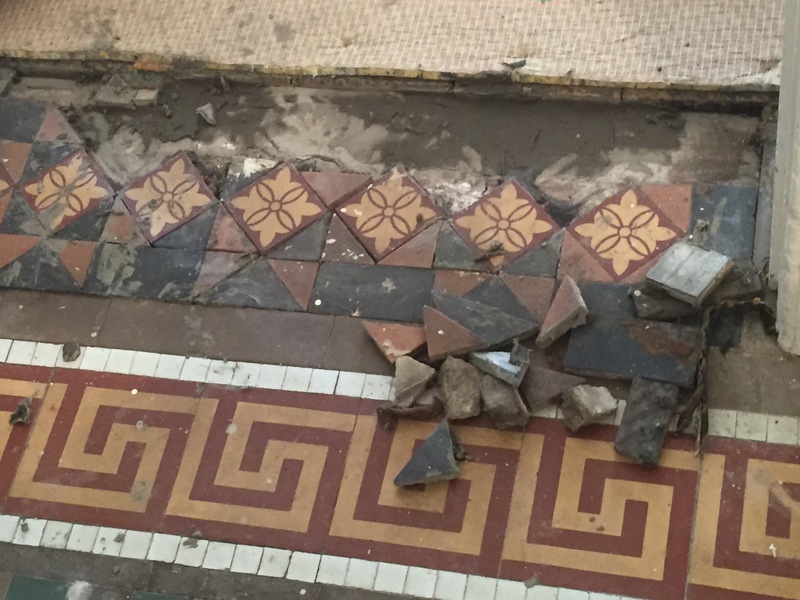 It’s difficult to know the cause of the damage but we normally find problems like these can be caused by settlement in the floor and if heavy objects are dropped on the tiles. 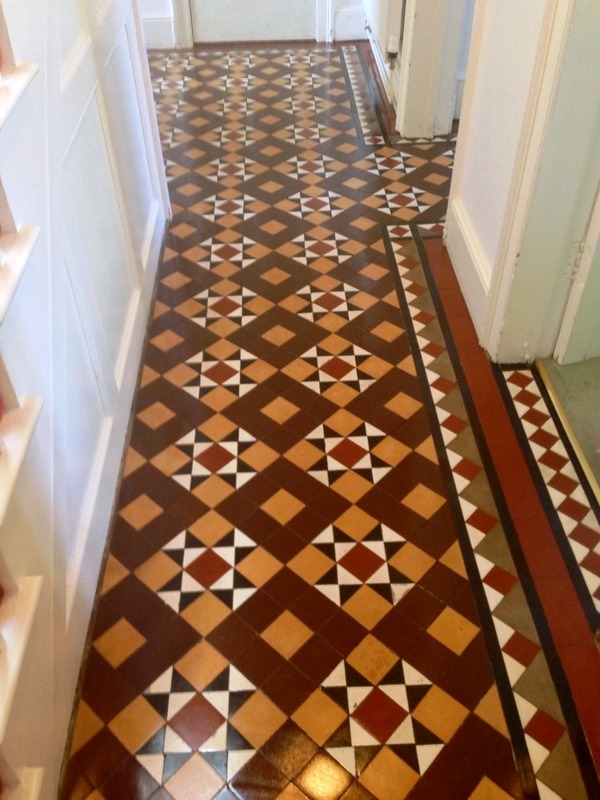 High traffic areas such as the hallway do get a lot of general wear and tear which takes its toll on the floor. 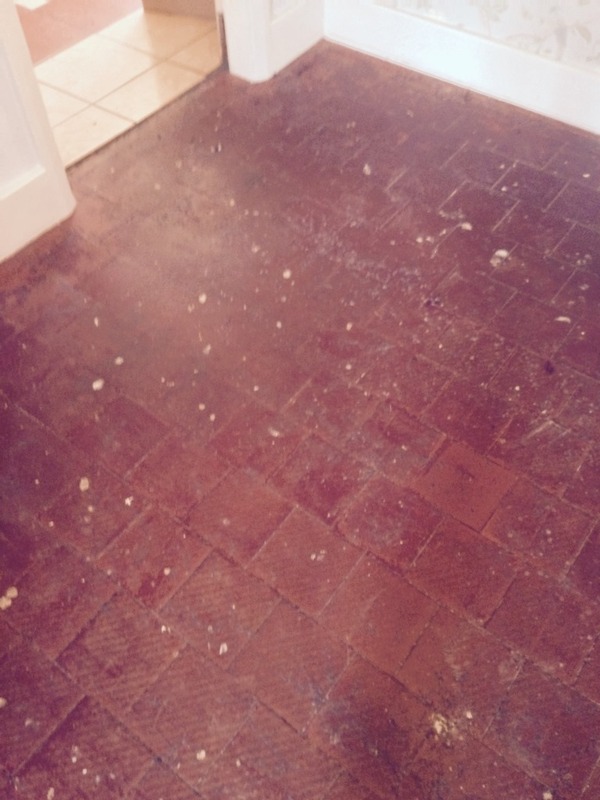 The owner of the house felt embarrassed with the condition of the floor and had decided it was time to have it restored. 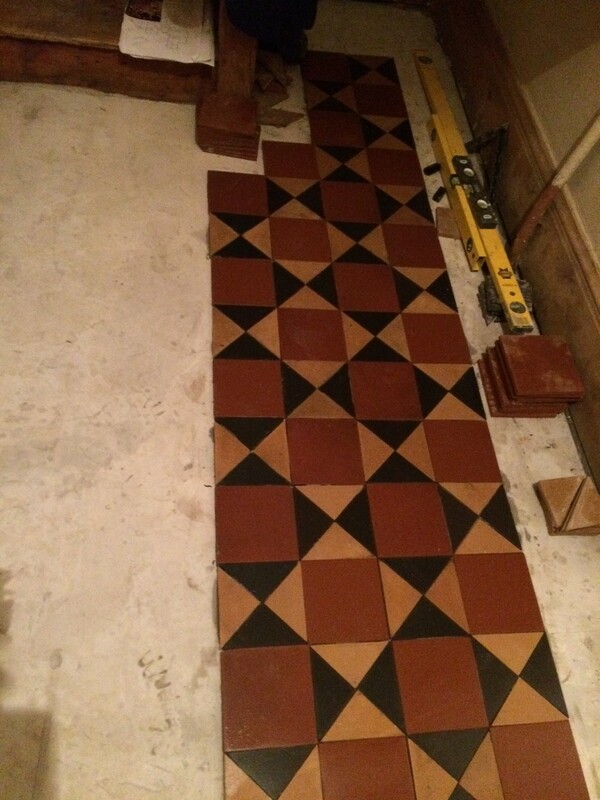 I identified the colours used in the floor, so I could source replacements and went through the floor with the client to mark the tiles that needed changing. 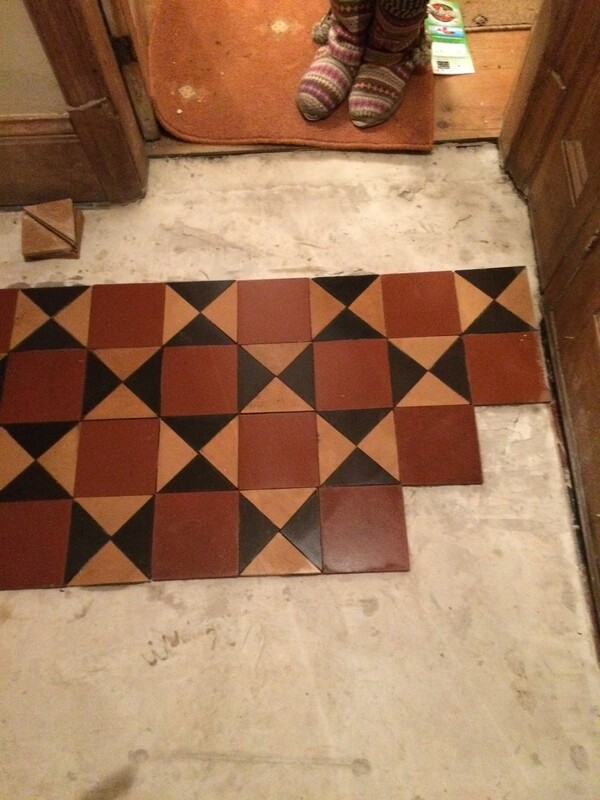 We left a few tiles with minor damage so that the new tiles did not stand out and kept the floor authentic. I managed to source some replacement tiles and started the job by removing and replacing all the damaged and loose tiles. Many of the replacements had to be hand cut to size, especially in the corners. 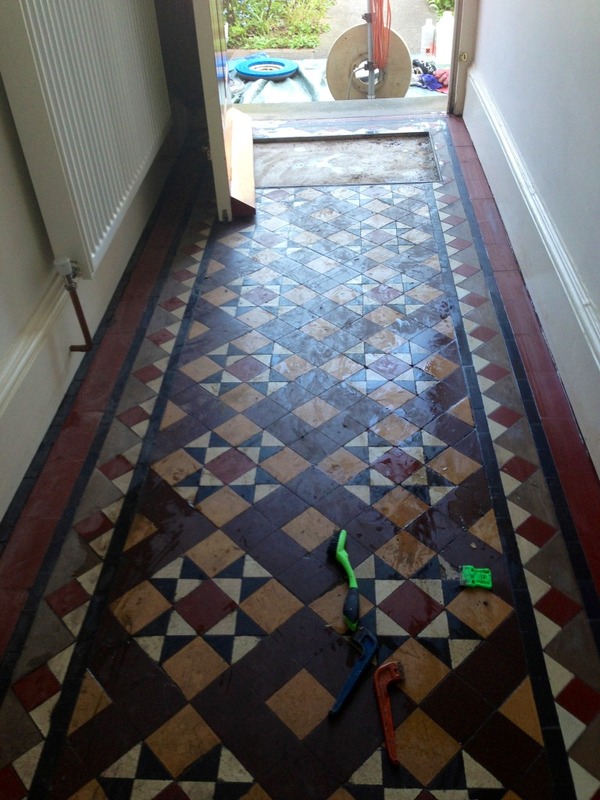 It took some time but eventually, all the damaged tiles were removed and replaced, and the loose tiles refitted. The floor was then left for a few days to set. On my return, I started by giving the floor a deep clean by spraying the tiles with a strong dilution of Tile Doctor Remove and Go. 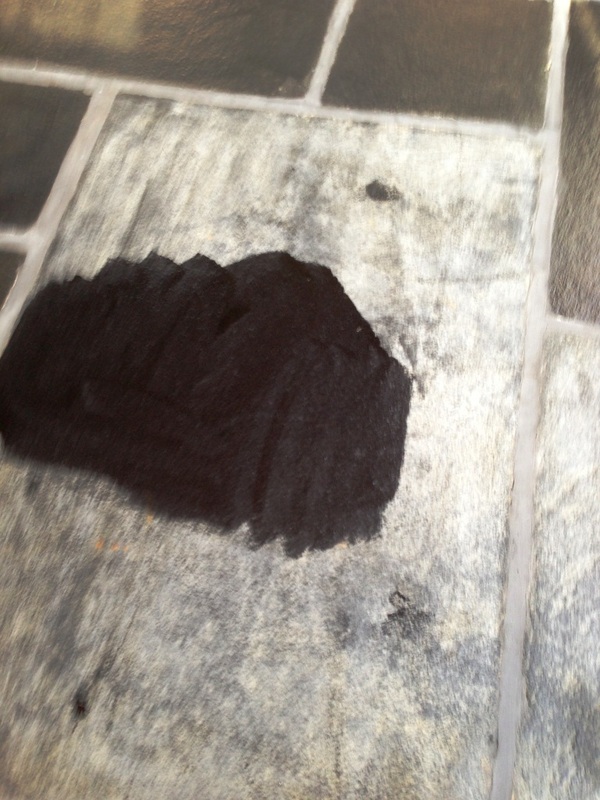 This was left on the tiles to soak in and break up the bonding agent in the old coatings. 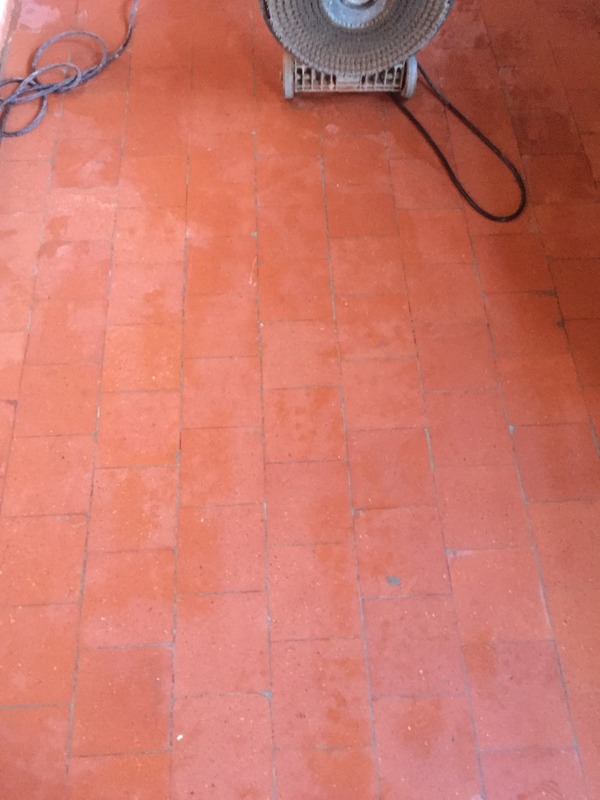 After ten minutes I worked the solution into the tiles with a black scrubbing pad fitted to a rotary floor buffer and then rinsed the resulting soil off the floor with water and extracted it using a wet vacuum. 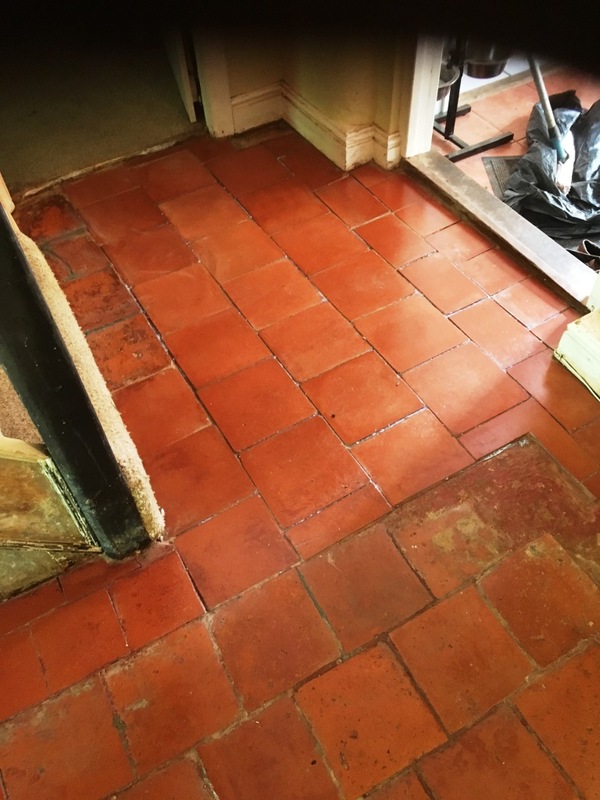 The next step was to give the floor an acid wash using Tile Doctor Acid Gel, we don’t normally use acidic products on tile or stone however they are particularly good at dealing with alkaline mineral salts and removing grout smears. 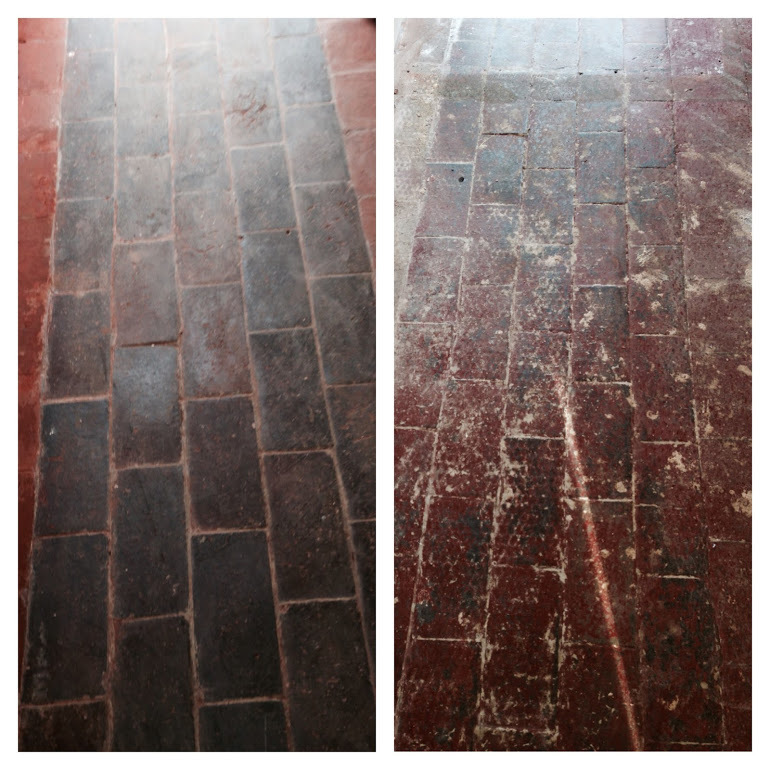 Old floors like these are particularly vulnerable to a natural process called efflorescence which results in white mineral salt deposits being left on the surface of the tile as the floor fully dries out and can interfere with the sealer. To counter this, the floor was given an Acid Wash with Tile Doctor Acid Gel which being in Gel form makes it particularly easy to control. The acid in the gel works by neutralising the alkalinity in the floor. 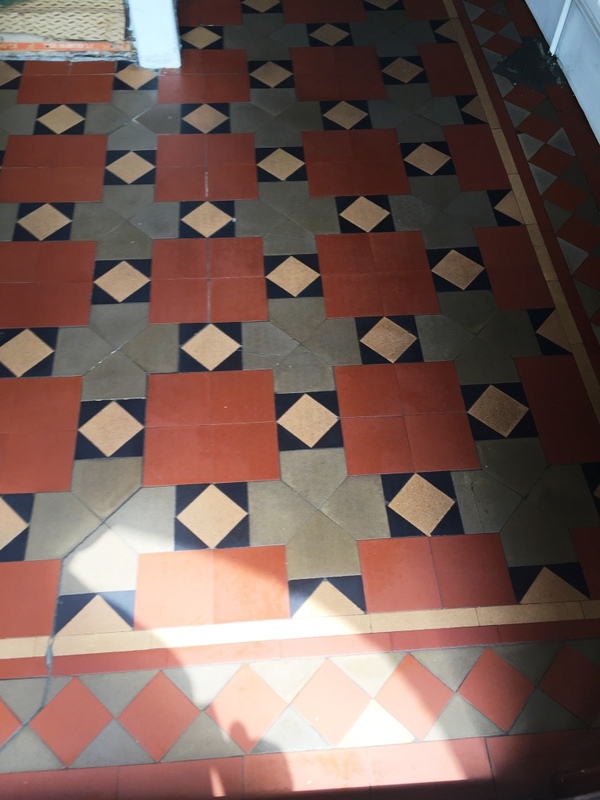 The solution was scrubbed into the floor using a coarse diamond encrusted burnishing pad to improve the finish of the tiles and then thoroughly rinsed with water and extracted with a wet vacuum to remove any trace of cleaning product. After leaving the floor to thoroughly dry out over a few days I returned to complete the sealing process. On my return, the floor was sealed with few coats of Tile Doctor Seal and Go Extra which leaves a nice satin finish and being a fully breathable sealer is ideal for old floors that have no damp proof membrane and needs moisture to rise through the tile, so it can evaporate. 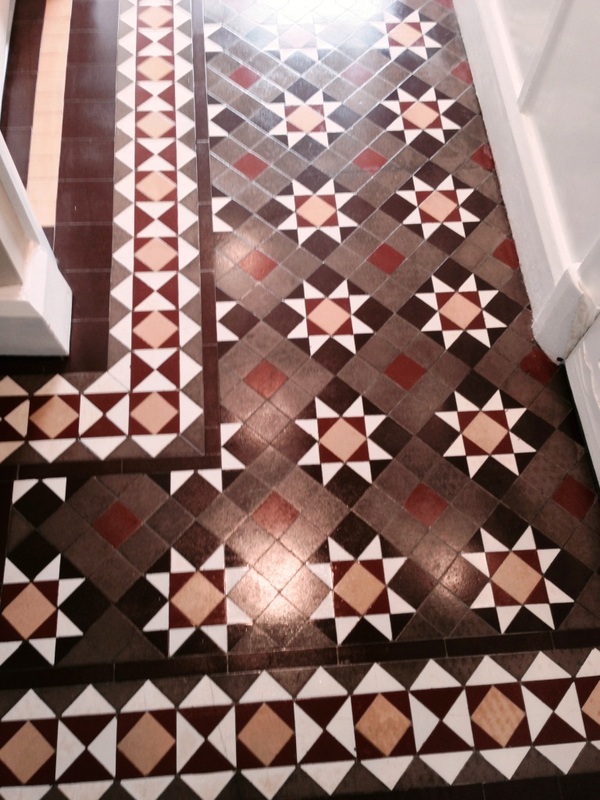 The vibrant colours of the tiles were brought back to life and the floor was transformed. The client was delighted and wondered why they had not called upon us sooner! 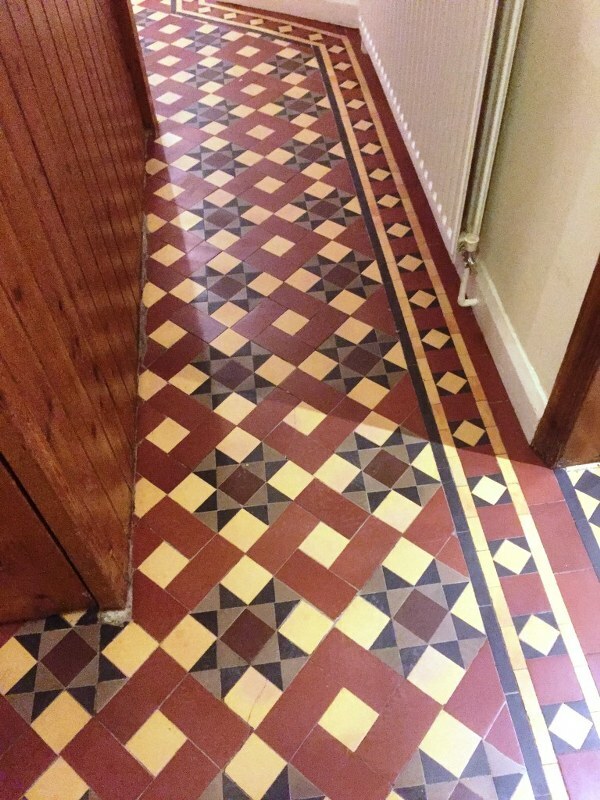 It’s a wonder why any property owner would want to cover an original Victorian tiled floor but I guess it was the fashion at the time. 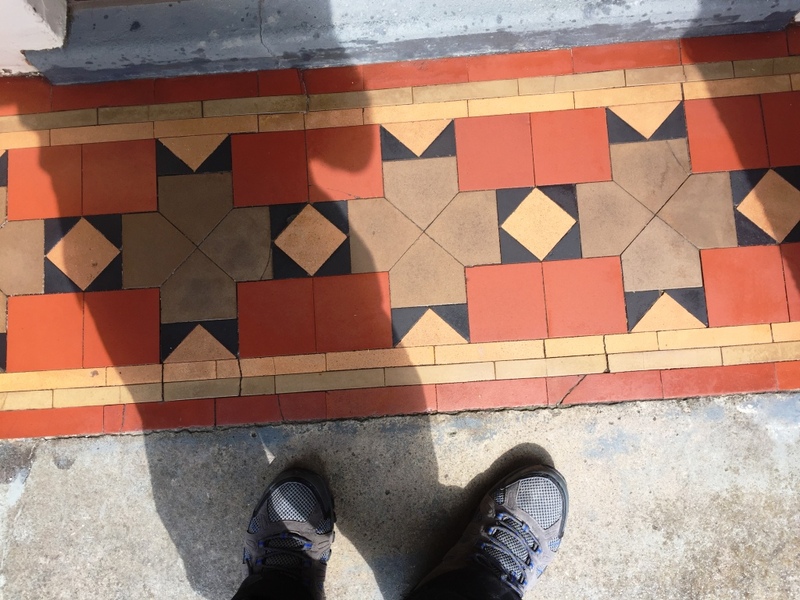 Fortunately, times have changed and home owners are now looking to restore original features back to their property as they bring a real sense of character and personality, especially if the tiles laid are colourful and have interesting design patterns. 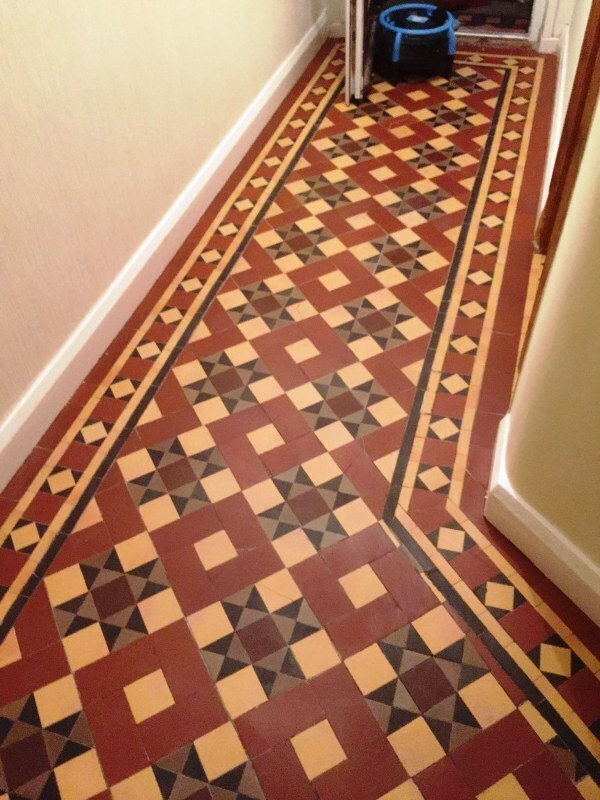 In this case the former owner of this house in Coundon near Coventry had opted to hide the fantastic hallway and doorway Victorian tiles with carpet some 15 years earlier. 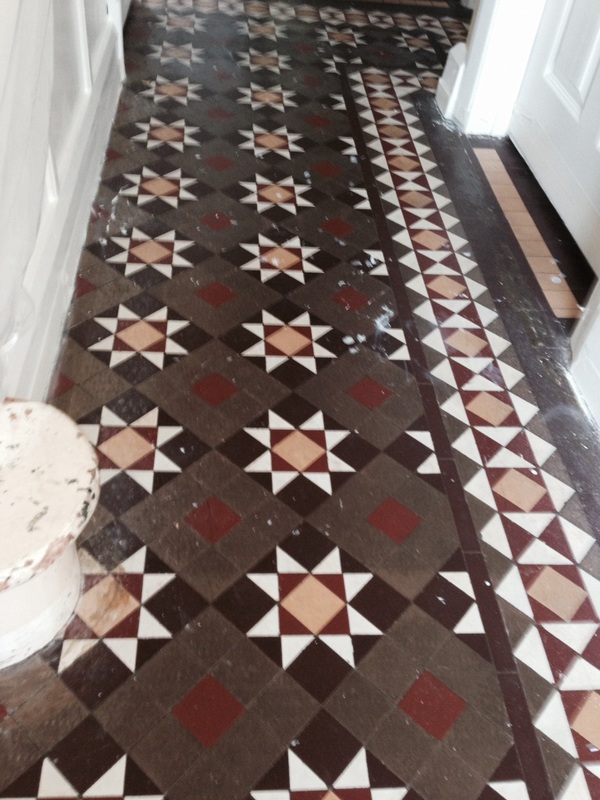 Now, the new owner was keen to restore the floor as an original feature. 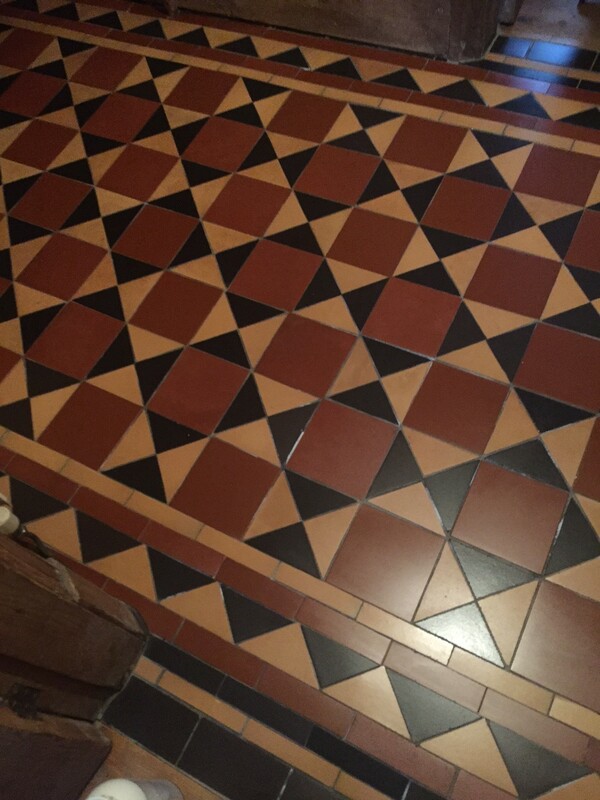 The tiles weren’t in great shape to begin with. 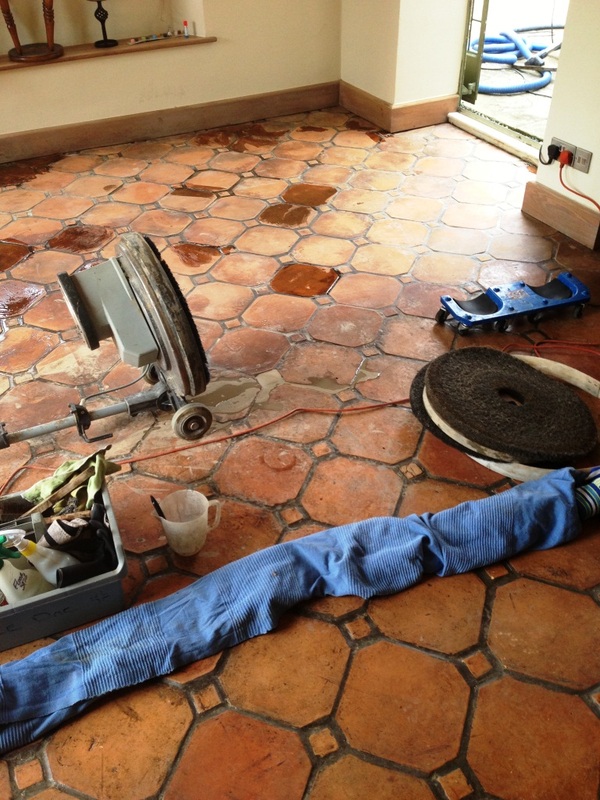 In several areas there was a need to reaffix or entirely replace some loose and damaged tiles. 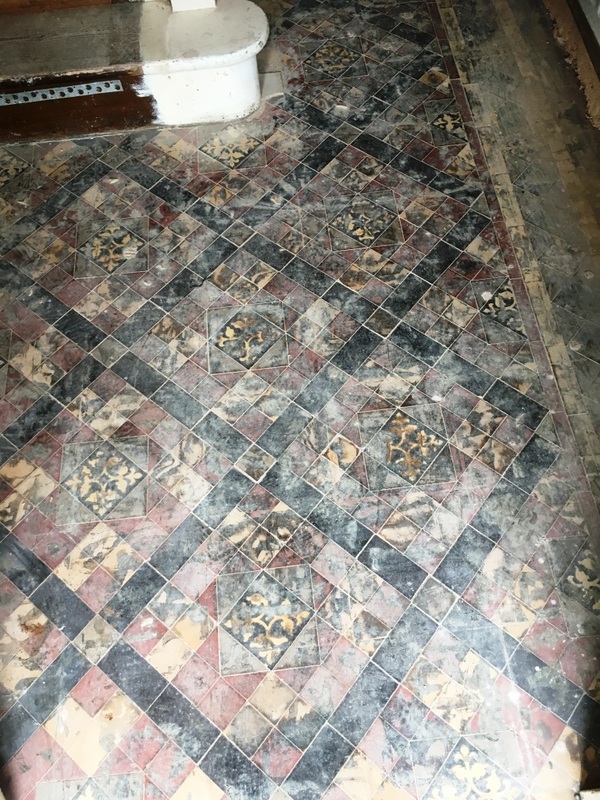 Needless to say, the tiles which has been hidden by carpet for many years were in dire need of a thorough clean and fresh seal, and there were areas where mineral salt deposits had emerged over time. A full restoration would require me to address all of these issues – here’s how I did it. 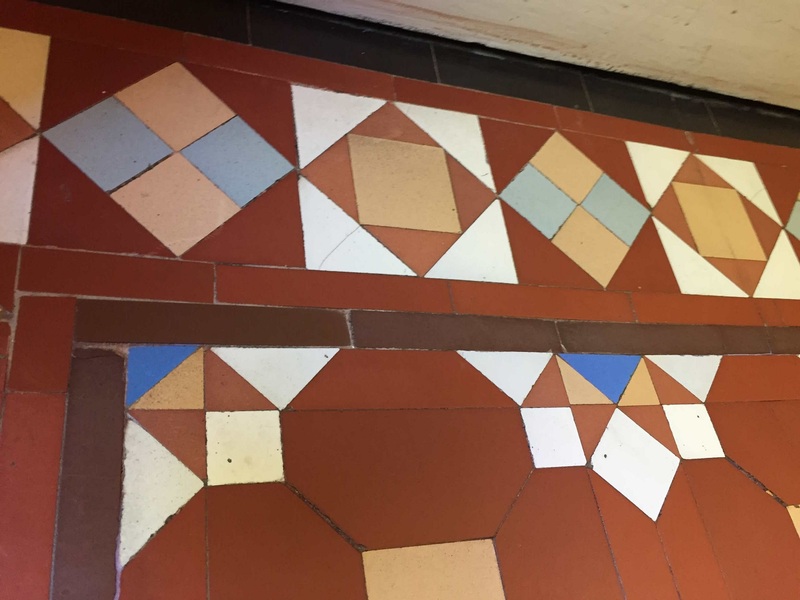 Prior to starting a deep cleaning process, I ensured the damaged and loose tiles were carefully replaced and re-grouted. 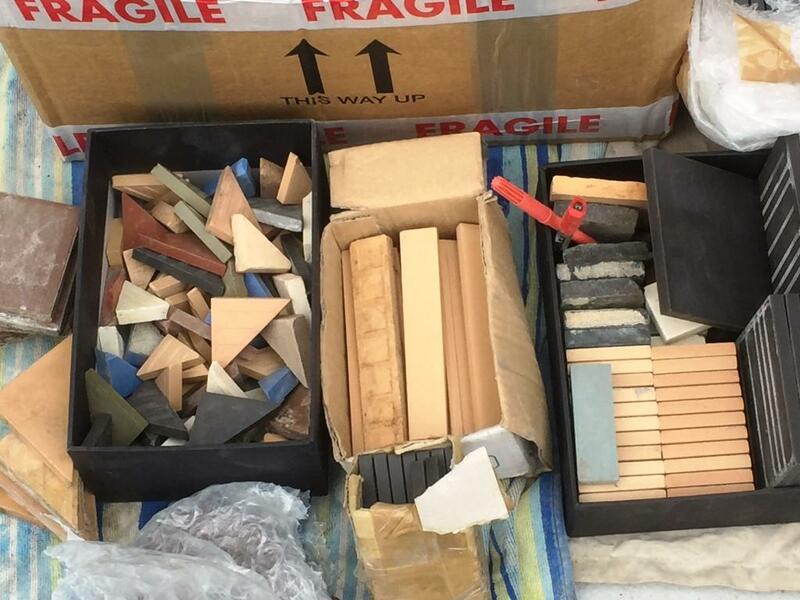 Fortunately, over the years I have built up a nice collection of spare Victorian tiles so sourcing replacements for the broken ones was not a big problem. 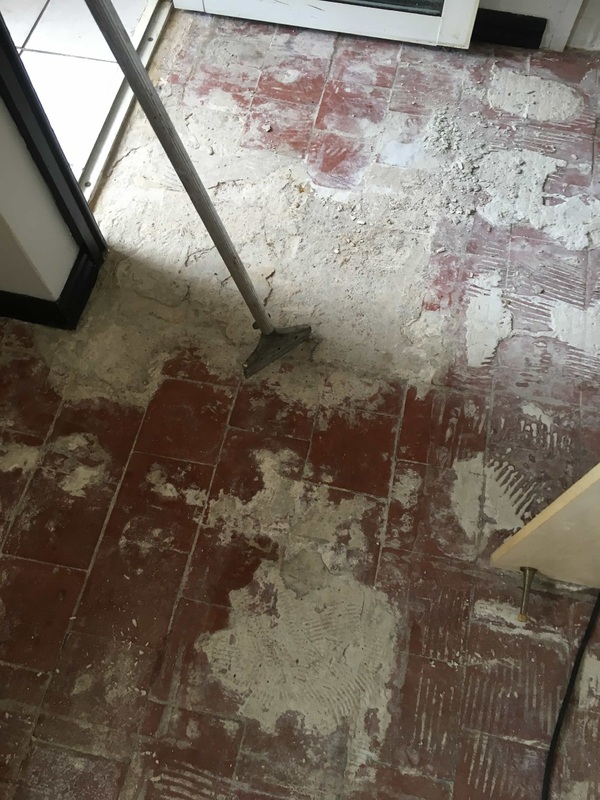 Then, to clean the tiles, I applied a strong cleaning solution consisting of Tile Doctor Remove and Go, which helps to remove any old sealers, and Tile Doctor Pro Clean, which deals with any ingrained dirt and general muck afflicting the tiles. 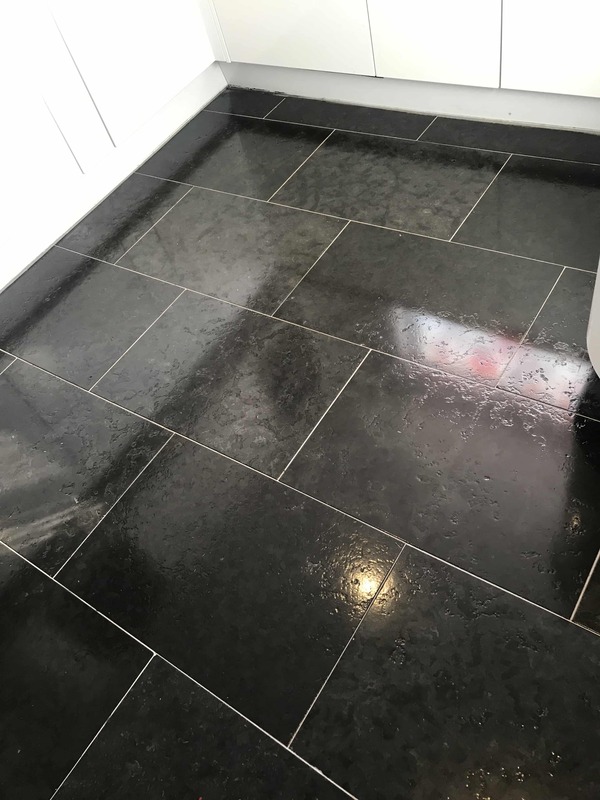 To help with the cleaning – especially in regards to the aforementioned minerals salts issue – I applied Tile Doctor Acid Gel, which is a blend of phosphoric and hydrochloric acids in a handy and easy-to-apply gel form. 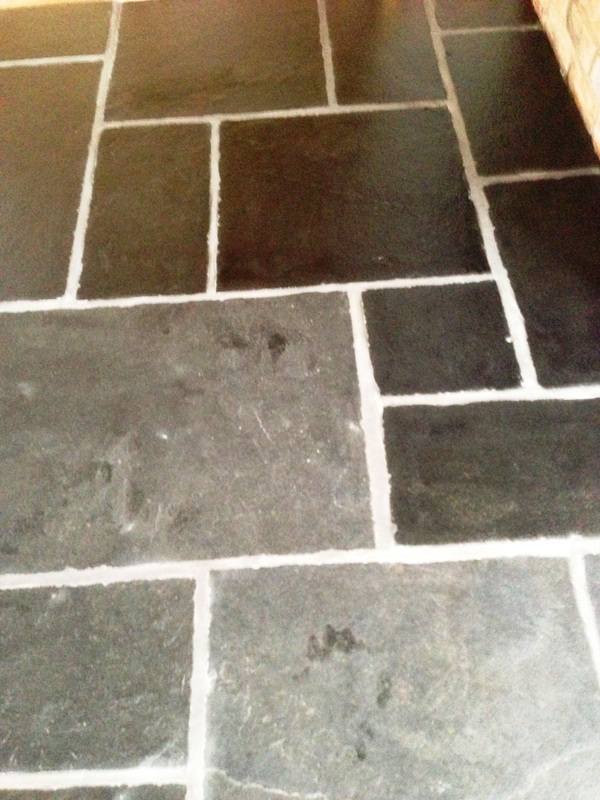 When worked into the tile using a black scrubbing pad, the Acid Gel successfully neutralised the alkaline-based salts. To finish off the cleaning process, I steam cleaned the floor, soaked up any excess moisture with a wet vacuum, and installed fans to speed up the drying process. 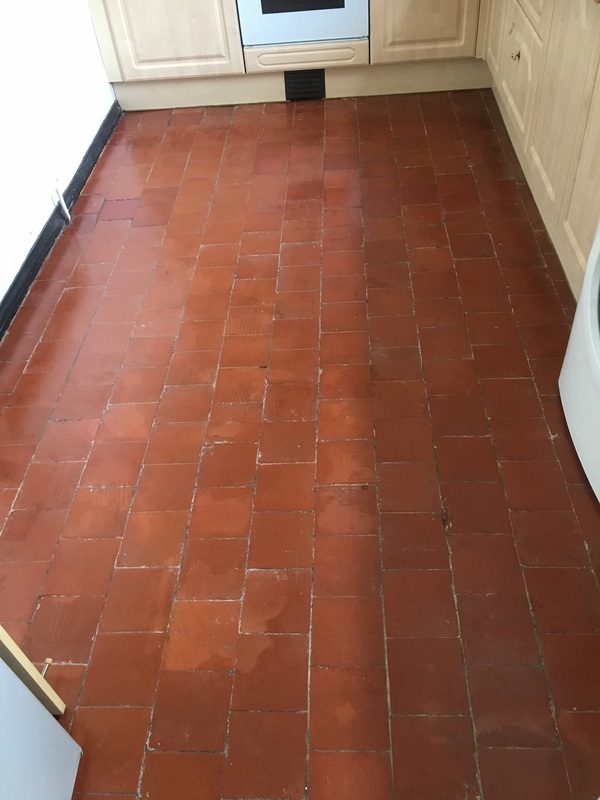 The next day the tiles were dry and ready to be sealed so I wasted no time and started the application of several coats of our impregnating sealer Tile Doctor Colour Grow. 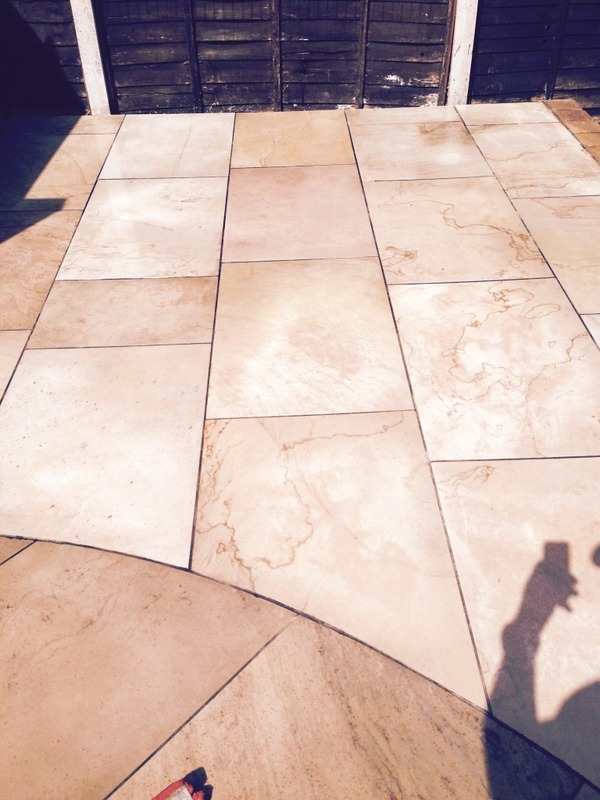 As an impregnating sealer, Colour Grow penetrates and fills the pores of the stone to prevent dirt from becoming trapped. 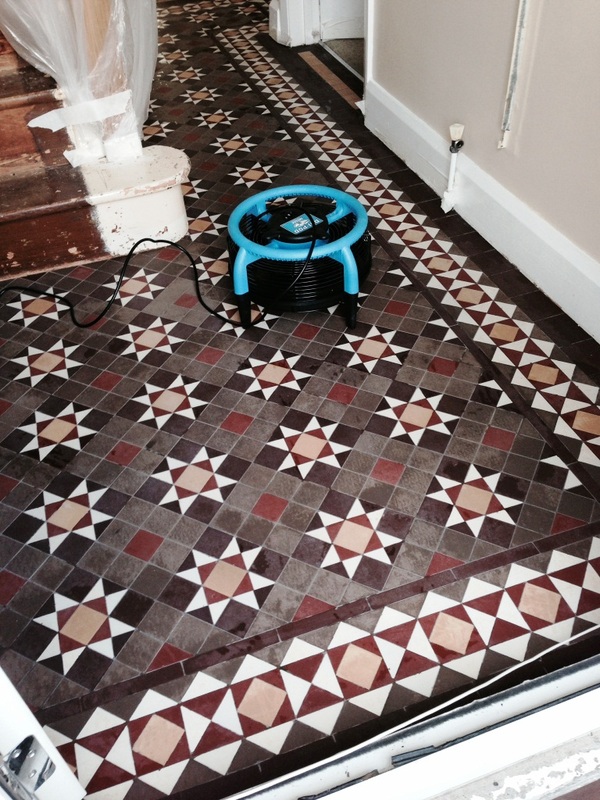 This makes it easier for the property owner to keep the tiles clean in future. Colour Grow also provides the added benefit of enhancing the colours in the tile, making them more vibrant and characterful. The natural matte finish left by Colour Grow was exactly as the customer requested. 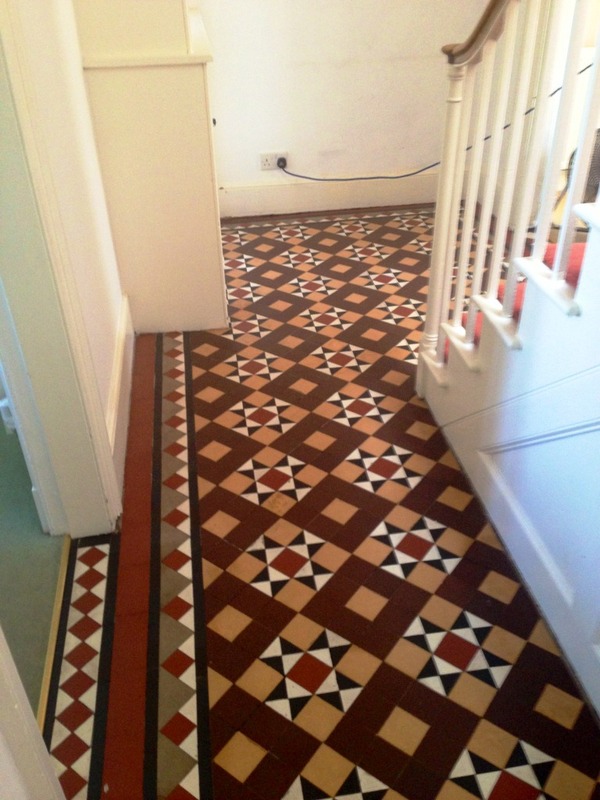 At the end of two days work I left the house with some revitalised Victorian tiles and a very happy customer. 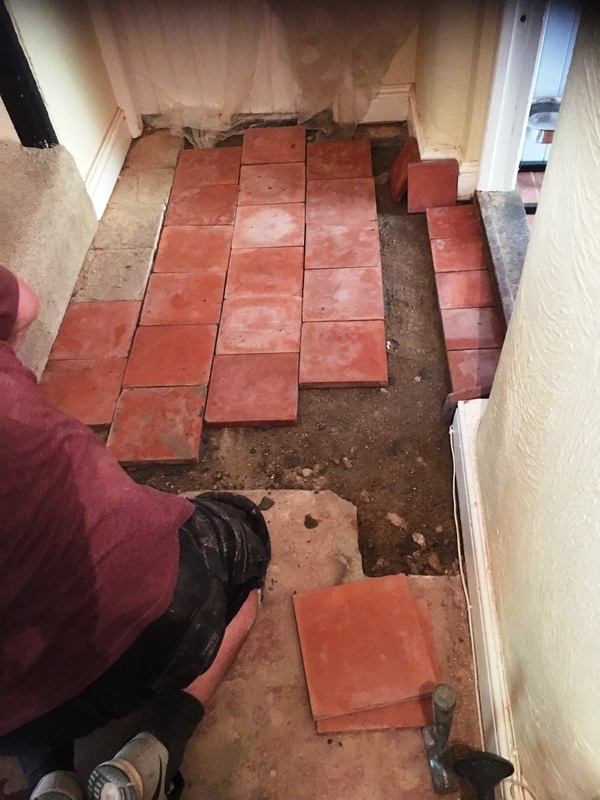 Newly built properties are not without their problems and often take a while to resolve all the snagging which occasionally extends to resolving problems with newly laid tiled floors. 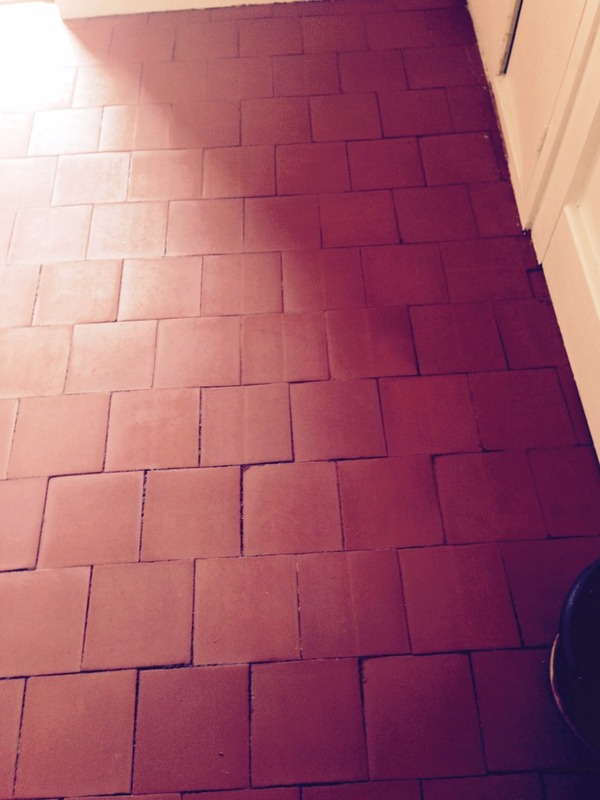 At this new property in the village of Malvern, and overlooked by the Malvern hills, the builders had left the Terracotta tiled kitchen floor covered in grout smears (also known as Grout Haze) following installation. 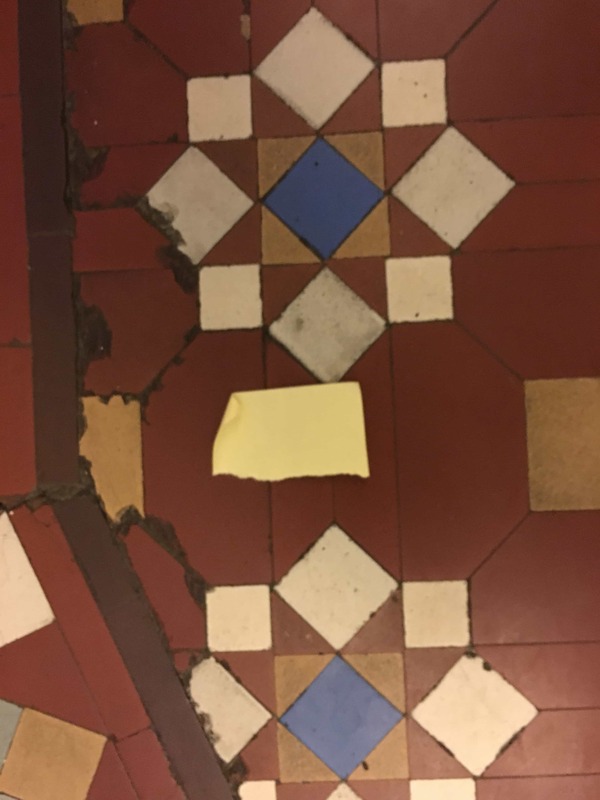 They had also neglected to seal the tiles, which was actually quite fortunate in this case as they would have sealed in the grout haze, making it more difficult to remove. 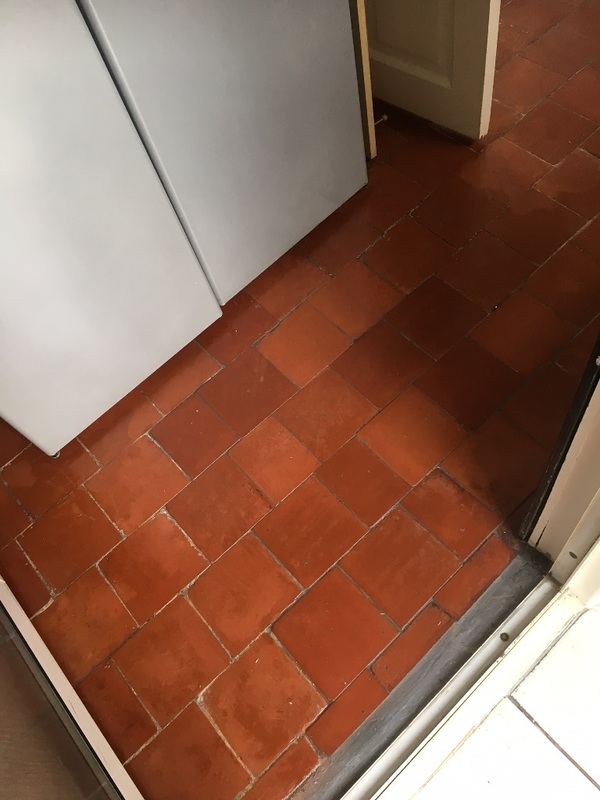 Naturally, the property owner wanted the problem to be resolved as soon as possible, and for me to make the tiles easy to keep clean in future, which can be achieved by sealing the tile. 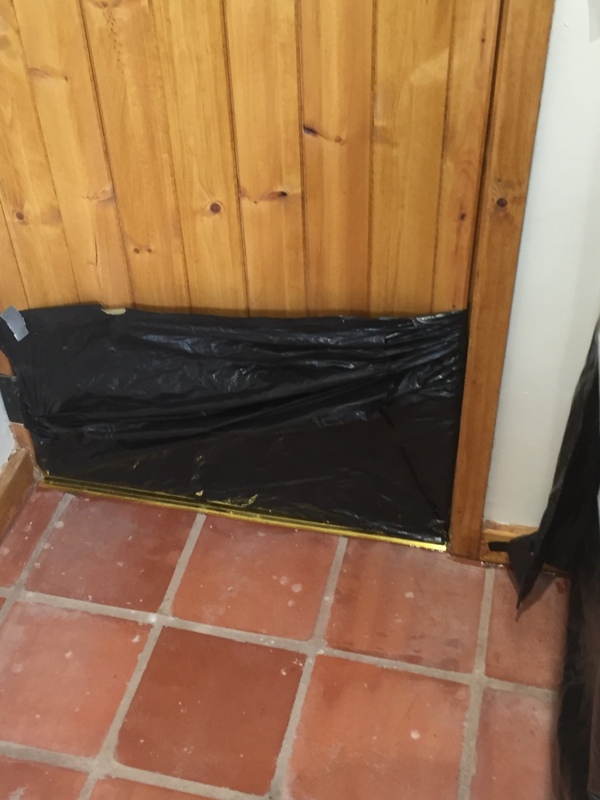 Before starting work, I made sure to fully protect any exposed woodwork with a plastic sheet covering to protect them from potential damage. 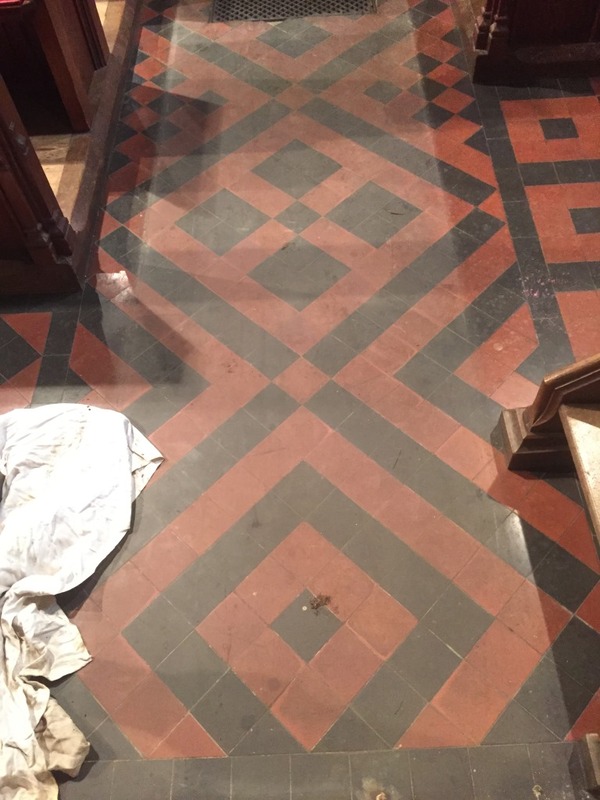 I then proceeded to give the floor a thorough clean, using Tile Doctor Remove and Go to clean the floor and eradicate some stains that had been left behind as a result of the building work. 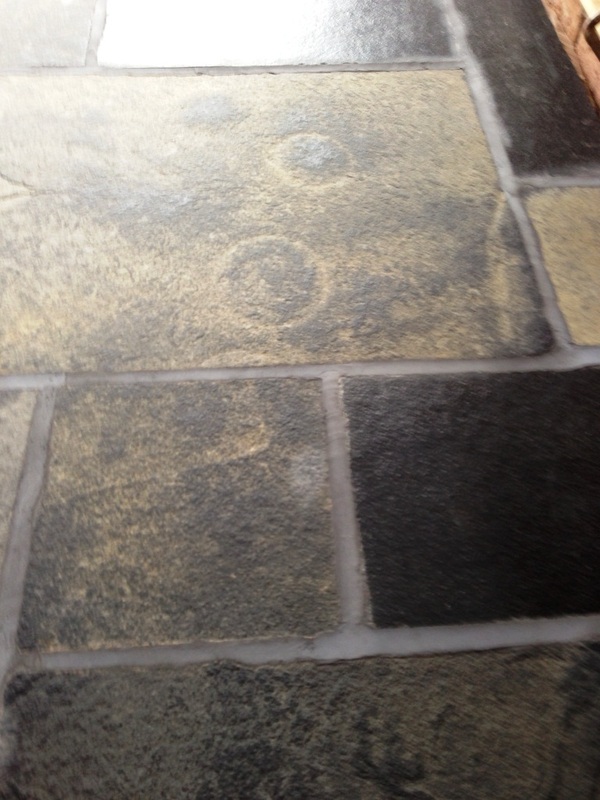 Next, I paid special attention to the grout, where the very visible problem of grout haze had arisen. 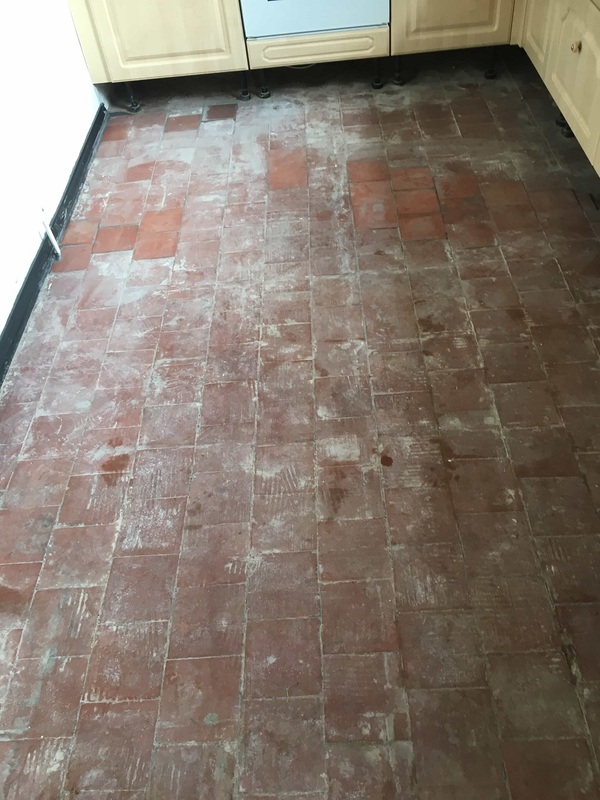 To neutralise these smears I used Tile Doctor Grout Clean Up, a concentrated phosphoric acid cleaner that can also remove alkaline mineral deposits and efflorescence. 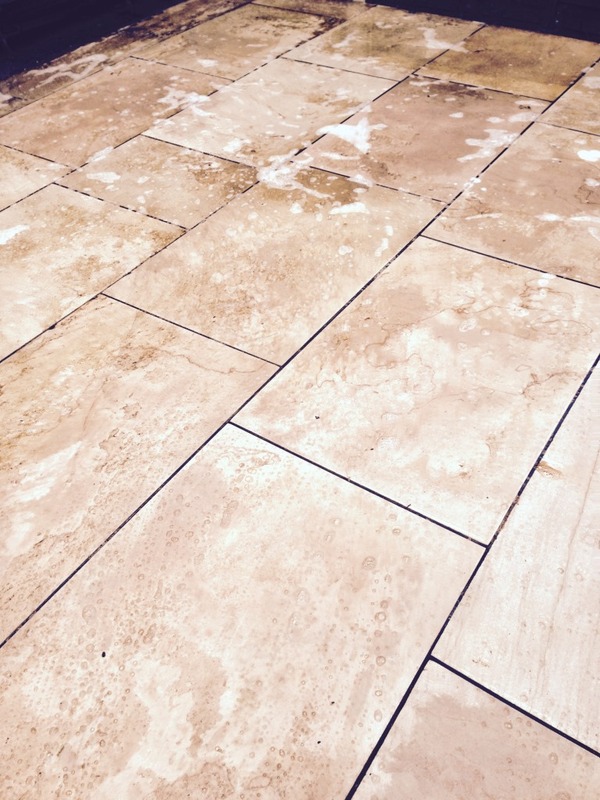 Grout Clean Up is only to be used on acid resistant stone, as sensitive stone can suffer from irreparable etching if it comes into contact with the product. 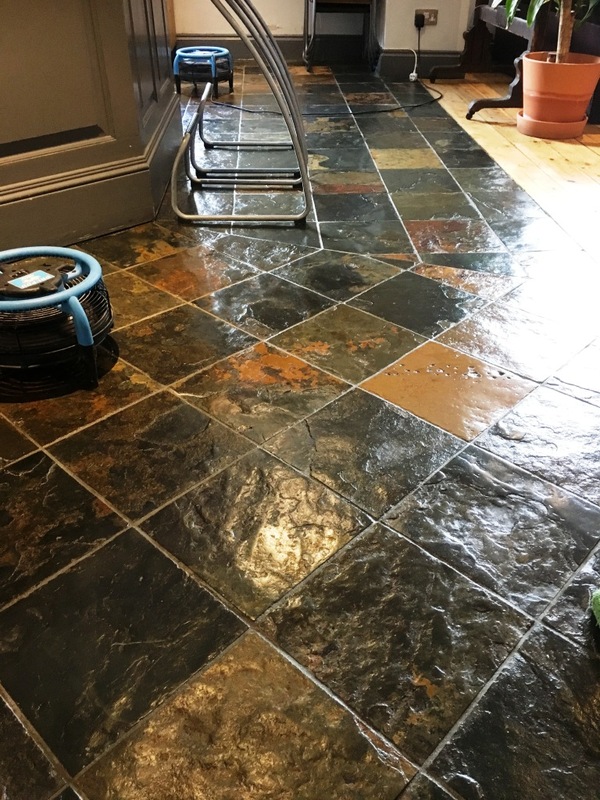 Once completely clean and free of grout smears the floor was thoroughly rinsed with water to remove any trace of product and then dried as much as possible with a wet vacuum, afterwards an air mover was installed to speed up the drying process. Later that afternoon the floor was dry and I was able to apply a sealer. 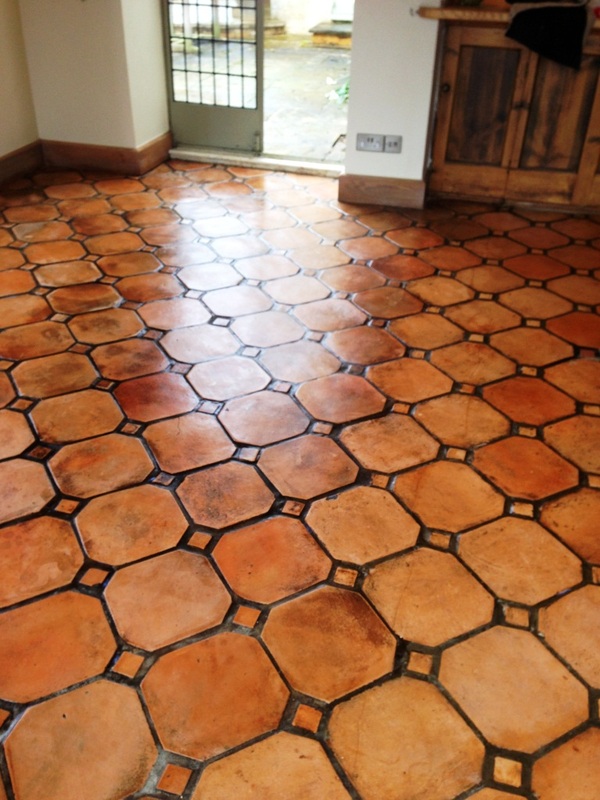 To do this I opted to use several coats of Tile Doctor Seal and Go Extra, a topical, fully breathable sealer that works really well on Terracotta. 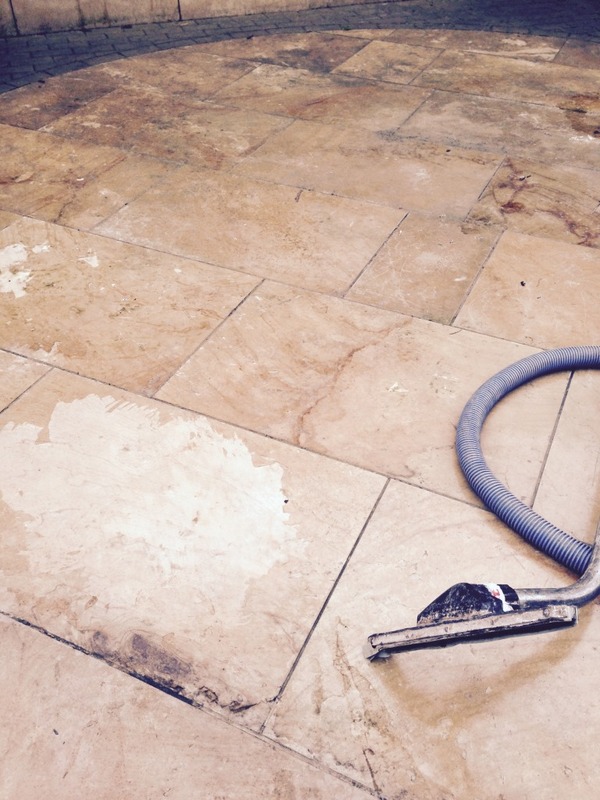 The sealer builds up a layer of protection on the surface of the tiles, protecting against ingrained dirt and stains. Seal and Go Extra also provides a high quality sheen finish which really did well to enhance the look of the Terracotta. 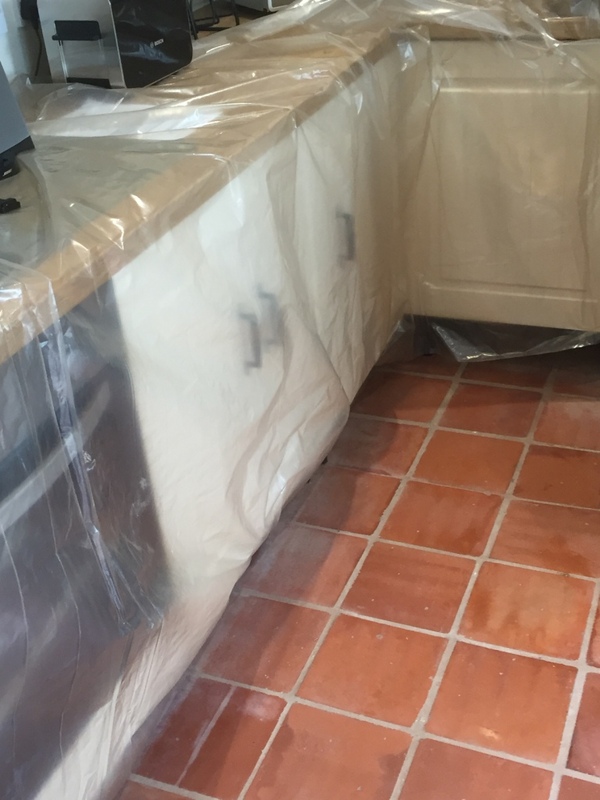 The property owner was exceptionally pleased with the results, and to have this problem dealt with quickly and efficiently, additionally the sealer will ensure the Kitchen floor is easy to keep clean in the future. 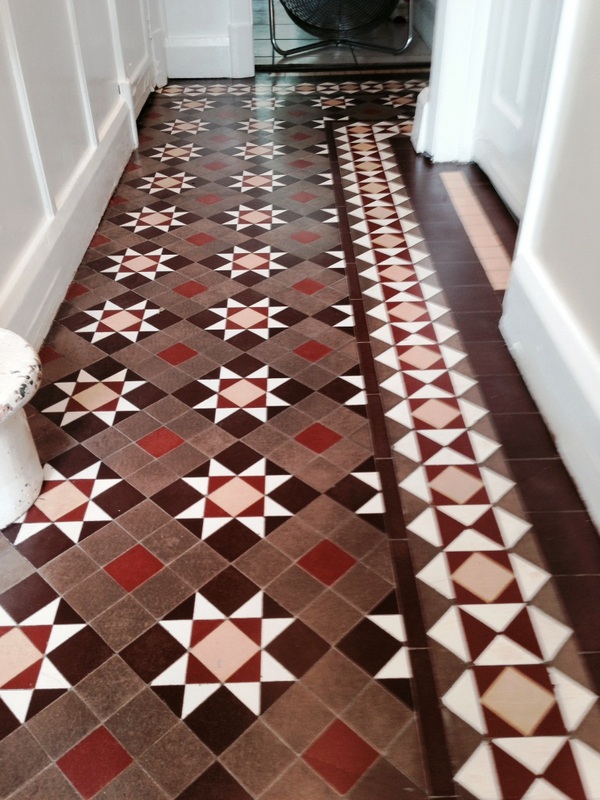 This Victorian tiled hallway was one of the most beautiful Victorian floors I have ever had the pleasure to work on. 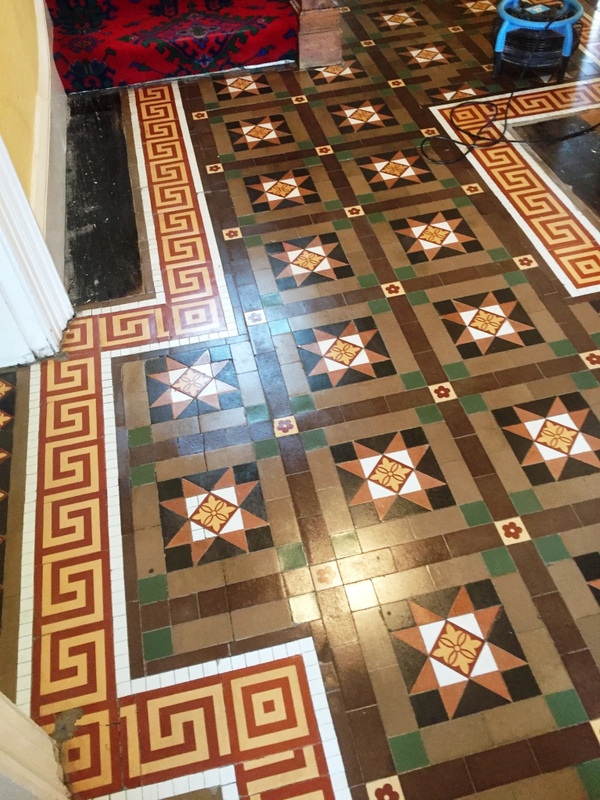 With the wide range of patterns and colours they are available in, it seems no two Victorian tiled floors are exactly the same, and this uniqueness is part of what makes them so appealing to property owners. 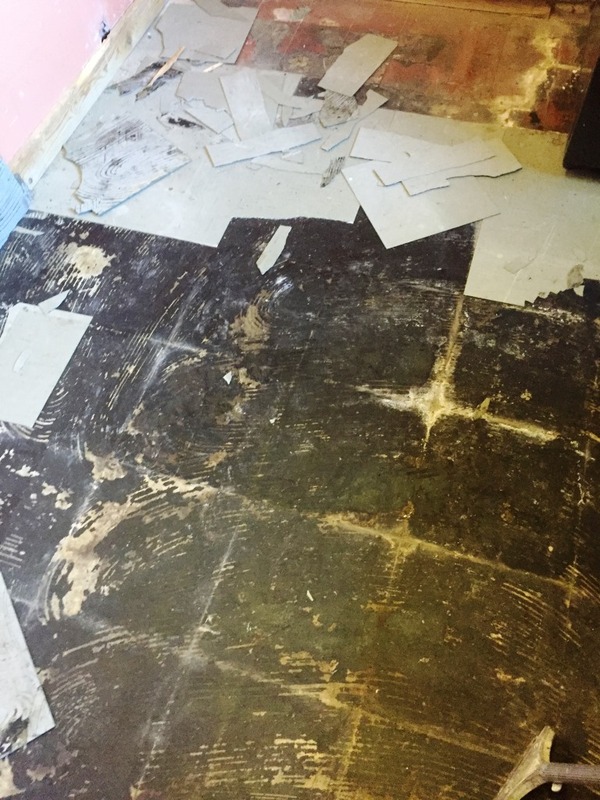 Unfortunately, this floor had been poorly maintained over the years, even suffering from a few loose and missing tiles. 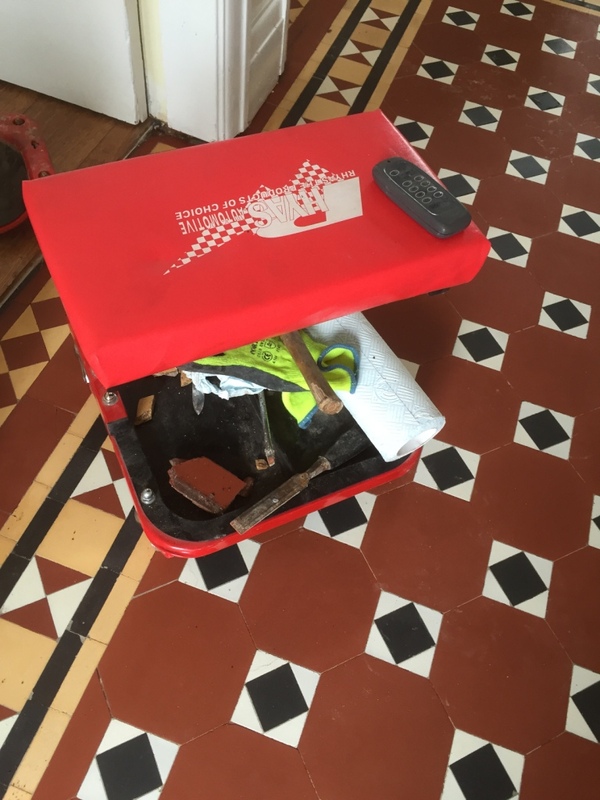 There was a thick coating of dust and dirt soiling its appearance, and the property owner was understandably keen to remedy the situation. Having realised that everyday household cleaners are not likely to achieve great results, she asked me to carry out a full professional restoration, including making some repairs where necessary. I was pleasantly surprised to find out that this property was situated in the town of Wyken, which is a few miles outside of Coventry city centre and in fact just down the road from where I live myself! 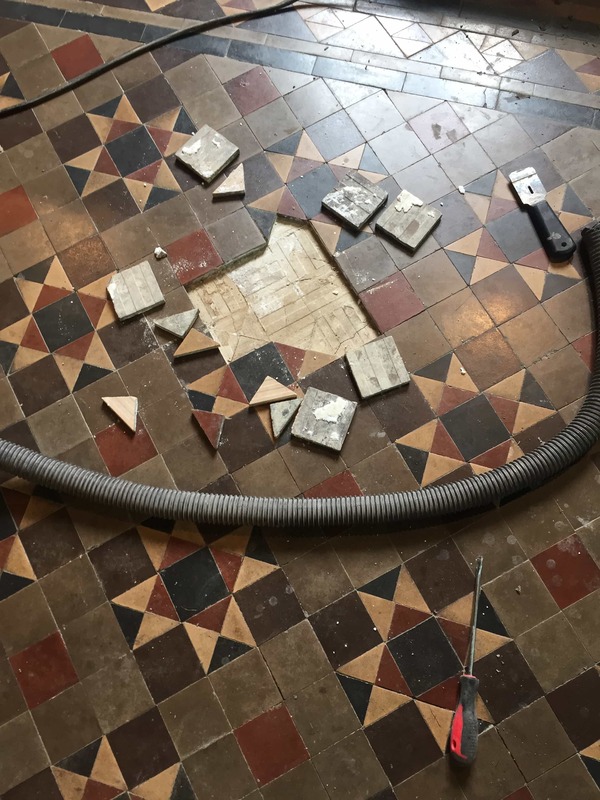 Before making a start on the cleaning process, it was first necessary to re-fix the small number of loose tiles and replace a single missing tile by the radiator. 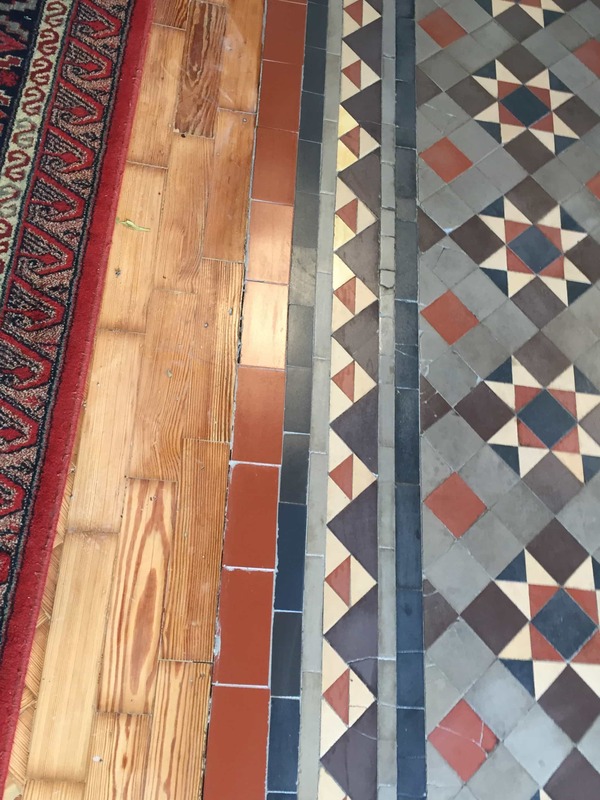 Fortunately, I’ve been working on these types of floors for some time and have built up a good collection of replacement Victorian tiles so I was able to find one that matched in nicely with the rest of the floor without too much problem. 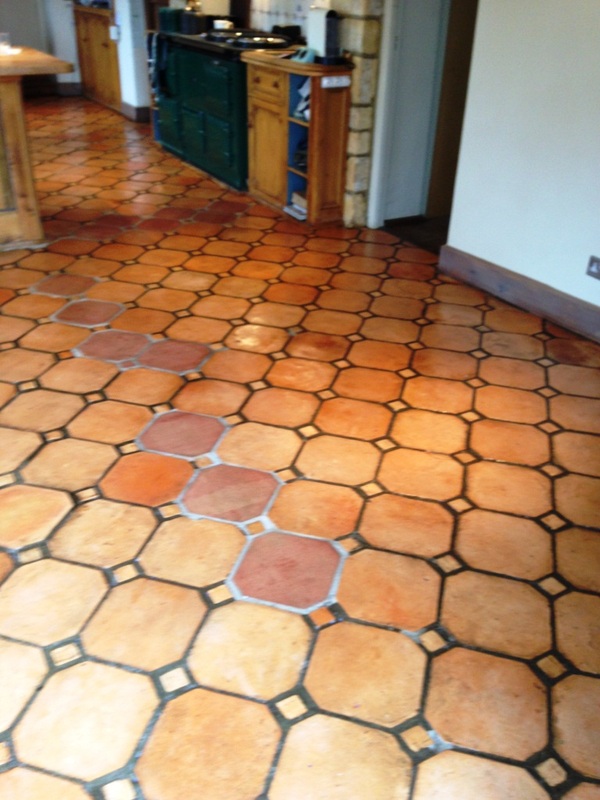 To clean the tiles, I began by applying a layer of Tile Doctor Oxy-Gel directly into the floor with a small brush. 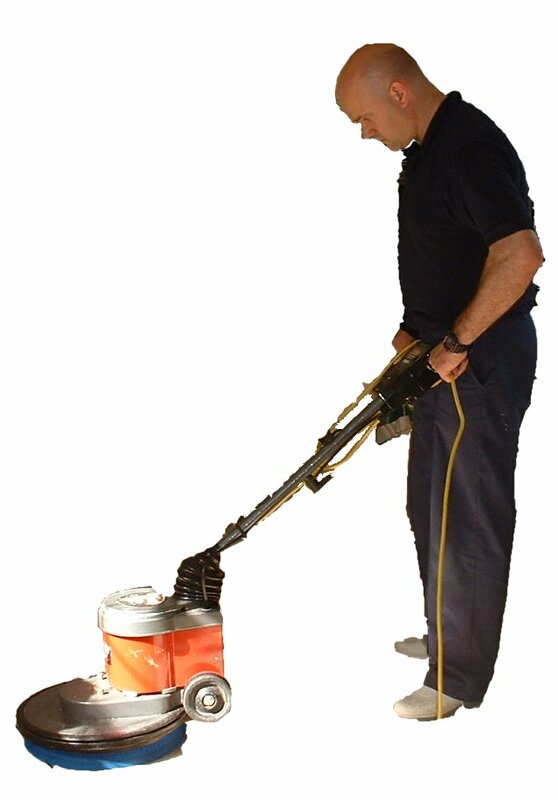 This product is very similar to the popular Tile Doctor Pro Clean: both are strong alkaline cleaners, strippers and degreasers, with the main difference being that Oxy-Clean comes in a gel form, making it easier to control and therefore ideal for precise cleaning, or for application to vertical surfaces. 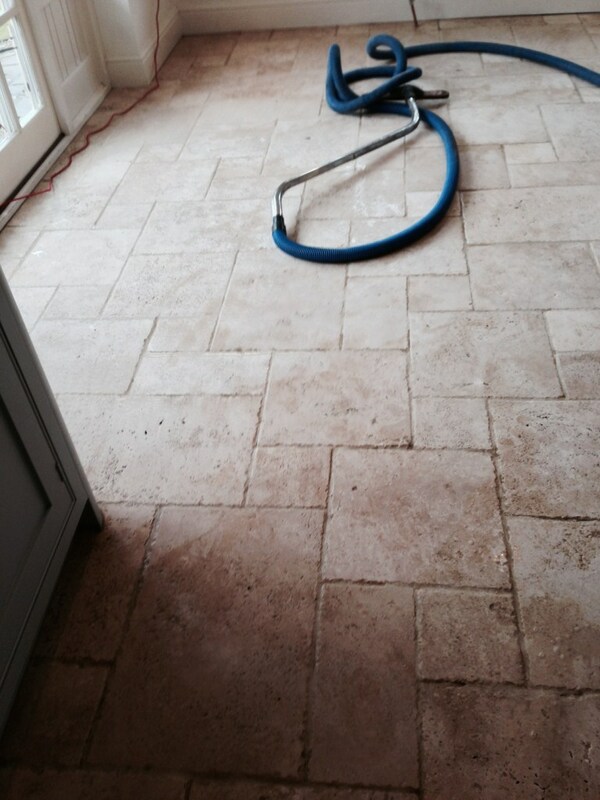 Like Pro Clean and being an alkaline base it is suitable for use on all types of natural stone and tile. The Oxy-Gel was left to soak into the tiles for around ten minutes before being scrubbed in and then rinsed off carefully with water, I then used a wet vacuum to extract the now soiled cleaning solution off the floor. 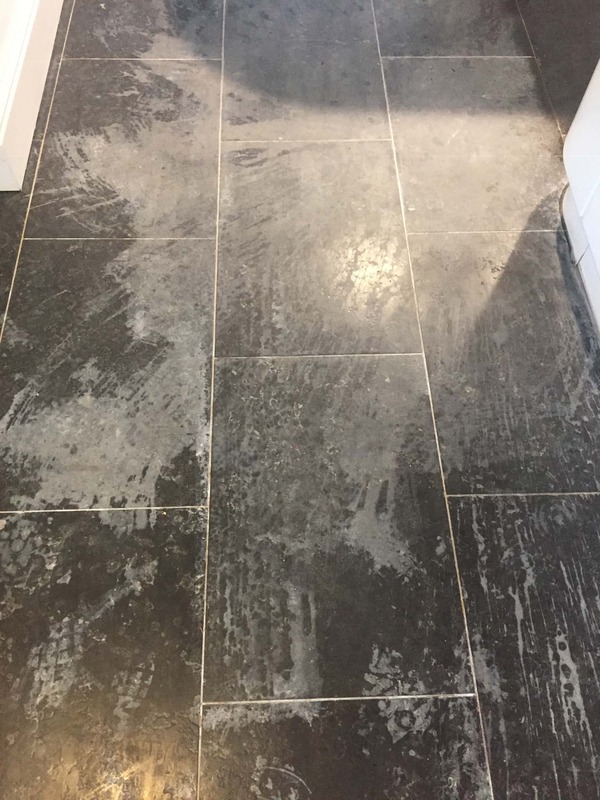 The next step was to acid wash the floor using Tile Doctor Acid Gel; this served to break down alkaline mineral deposits inherent in the grout along with some excess grout that had been left on the untidily left on tile from installation. It is recommended not to use this product on acid-sensitive soon such as Marble and Limestone as it can cause irreparable etching but its fine on Victorian tiles as long as you don’t leave it on too long. 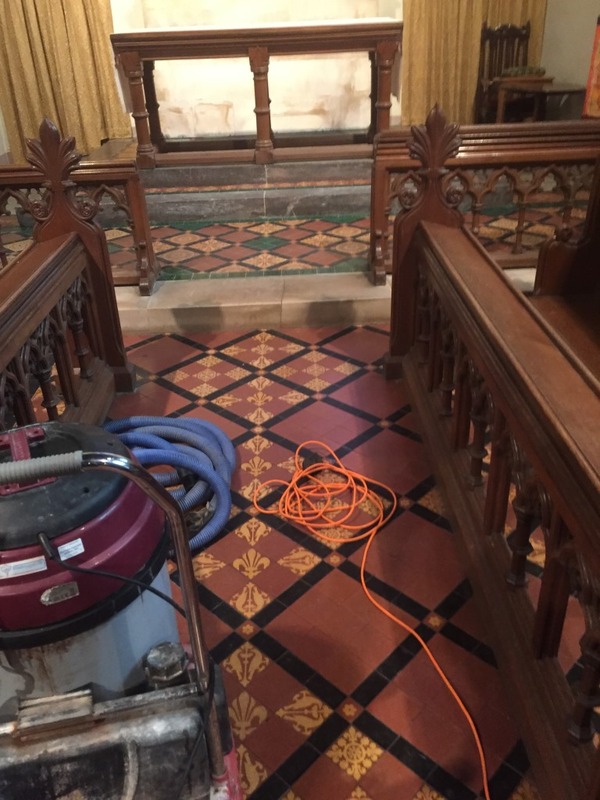 Finally, the floor was given a rinse with clean water to remove any trace of chemicals from the cleaning and to neutralise the area in preparation for sealing. 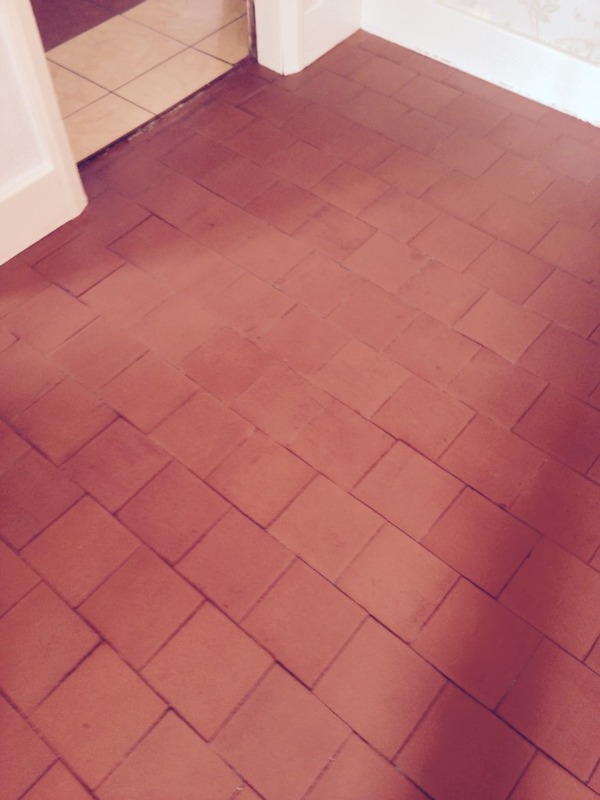 I left the floor for 48 hours to dry before returning to the property to seal the tiles. This allowed plenty of time for the floor to dry completely, which is important as any excess moisture can damage the ability of the sealer to protect against dirt and stains. 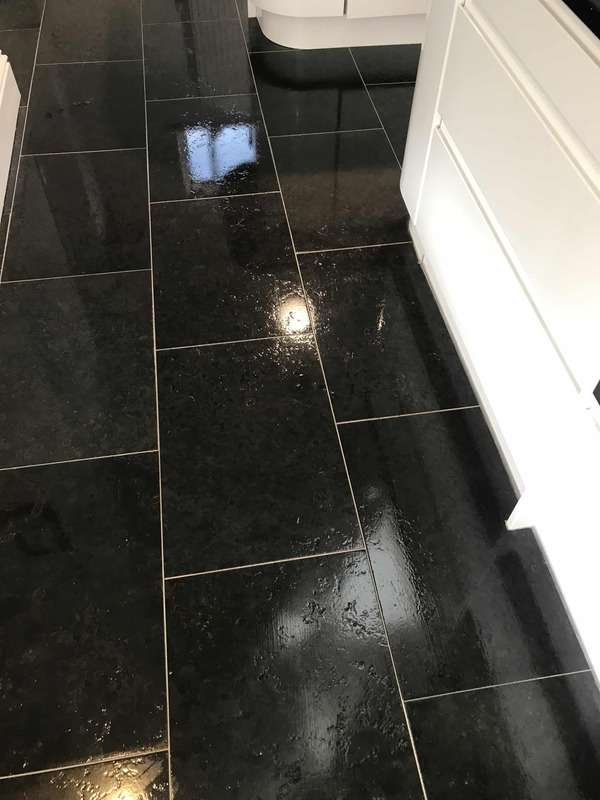 My choice of sealer for this floor was Tile Doctor High Shine; three coats in total were applied, providing – as the product name suggests – the high shine finish that the customer had requested. 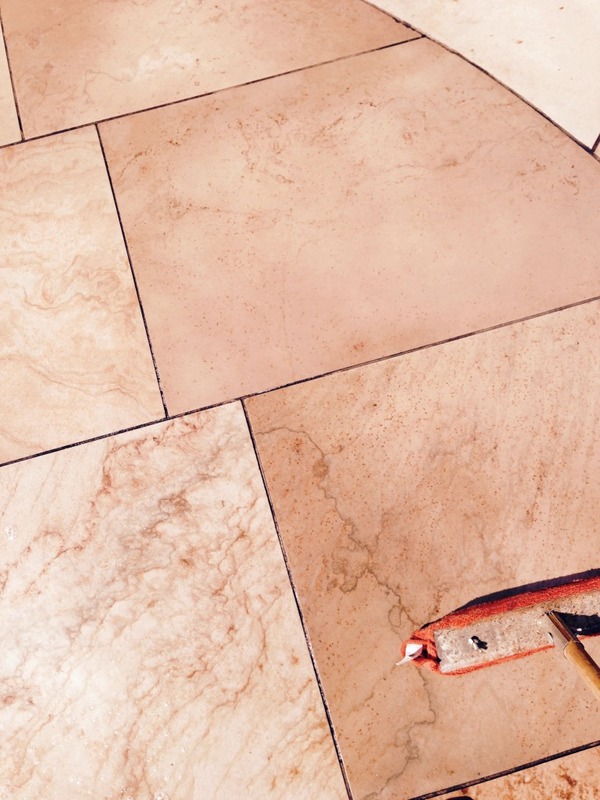 The sealer will provide durable surface protection going forward preventing dirt from becoming ingrained into the pores of the tile and ensuring it remains easy to clean and keeping its appearance for some time to come. 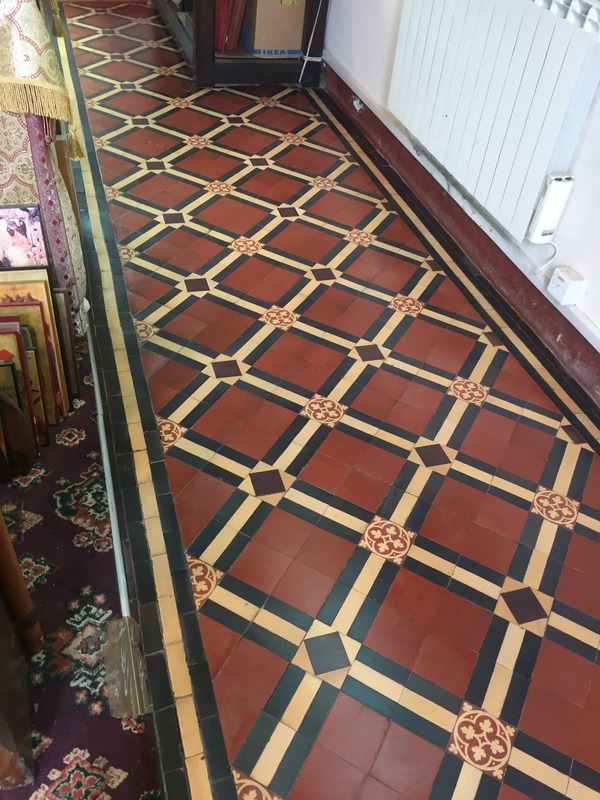 As a big fan of Victorian tiles, it was a great pleasure to restore this floor, and my customer was certainly pleased too. It’s amazing how far a little professional maintenance can go to improving the appearance of these fantastic types of floor. It’s been my experience that it’s not un-common to discover fantastic tiled floors hidden underneath an additional layer of flooring usually carpet or linoleum. 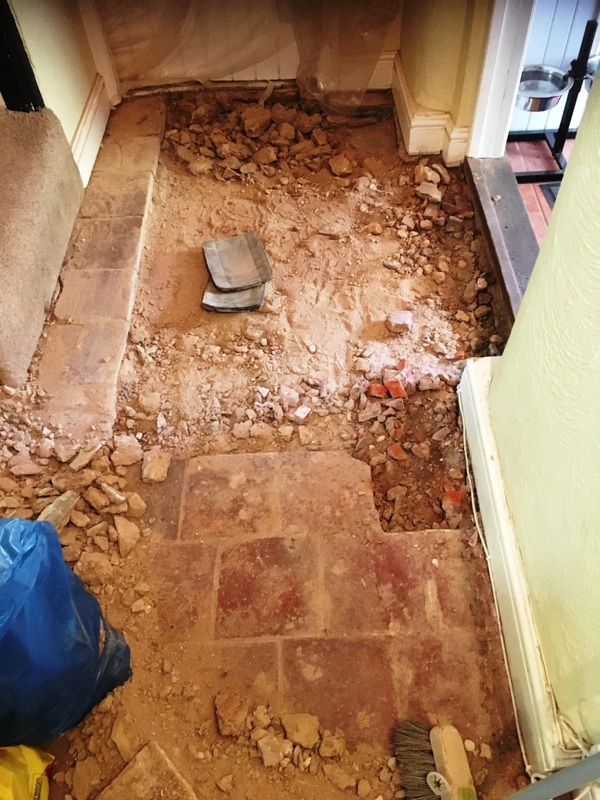 This was the case with this property, situated in the town of Canley, Coventry, where the owner had found a Quarry tiled floor underneath Vinyl tiles which had been stuck down using an adhesive. 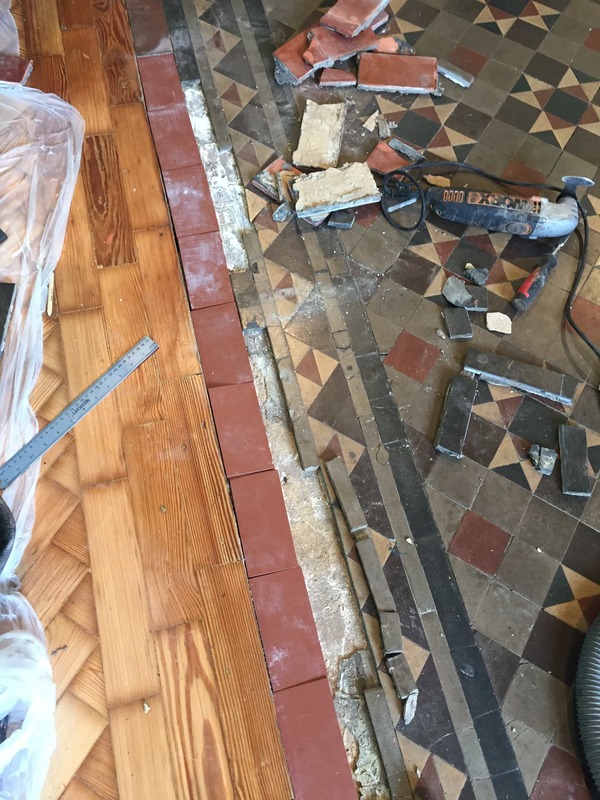 Quarry tiles are typically hard wearing and very durable and a sensible choice for flooring in high traffic areas of both residential and commercial properties, a tiled floor is of course a difficult to remove so it’s not surprising that tiles do get covered over rather than replaced during redecoration. 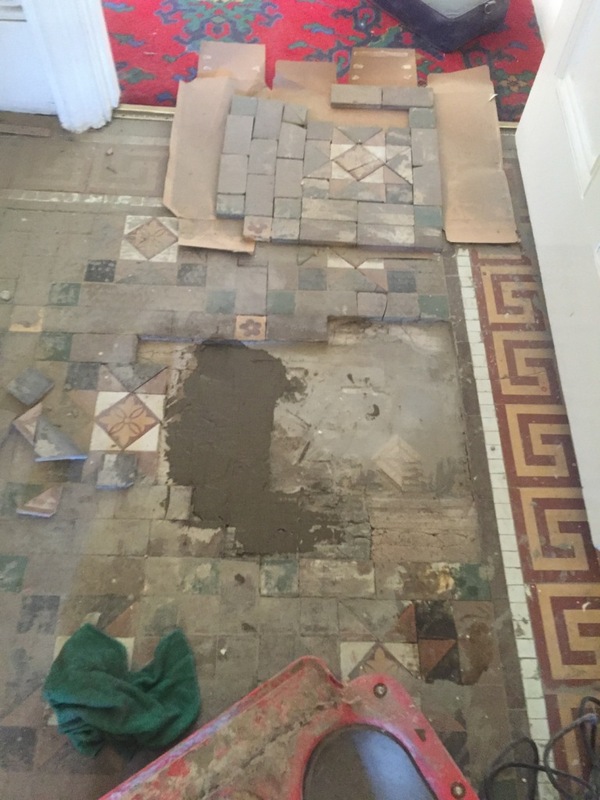 Taste’s change and like most property owners who unearth hidden tiled floors, my client was keen to restore them as an original feature. 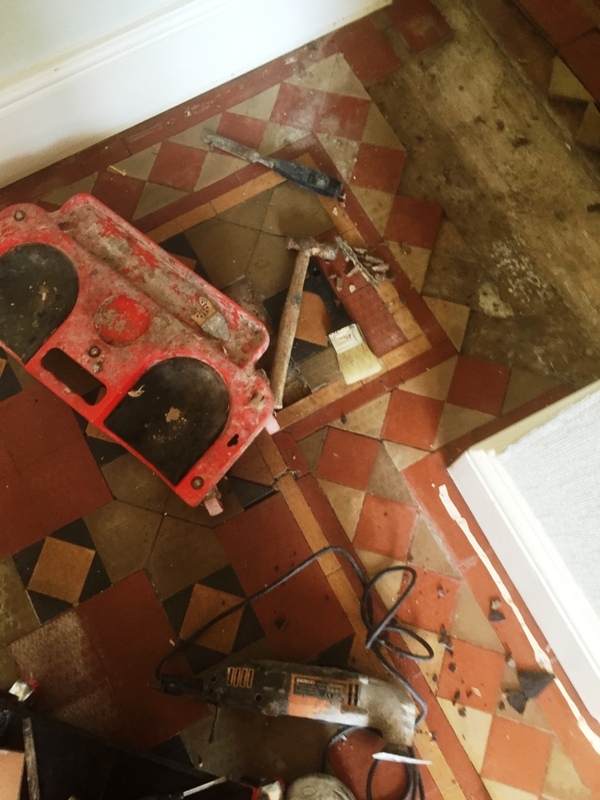 Despite the amount of adhesive and the poor state of the Quarry tiles, I was confident that the floor could be restored to new, so we agreed a date for me to come back to the property and complete the work. 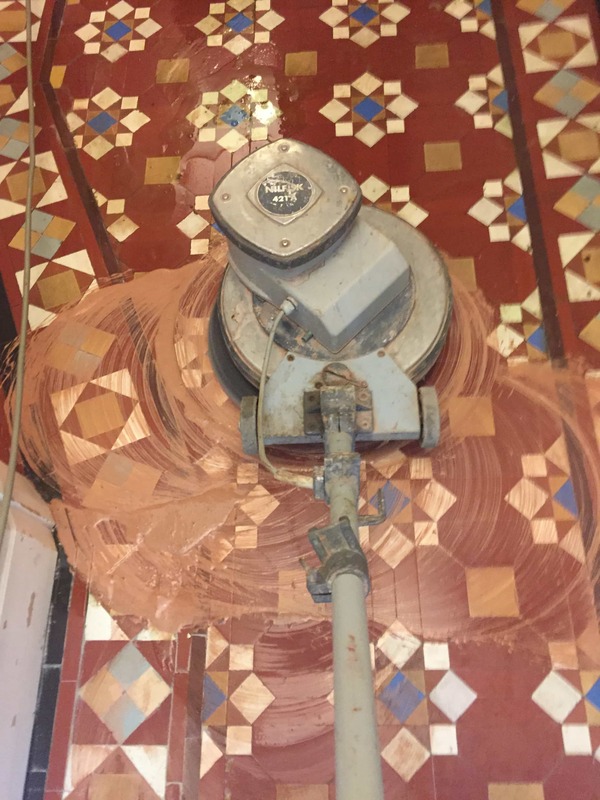 The process of cleaning the Quarry tiled floor – including remove large amounts of adhesive – took a total of two days to complete. 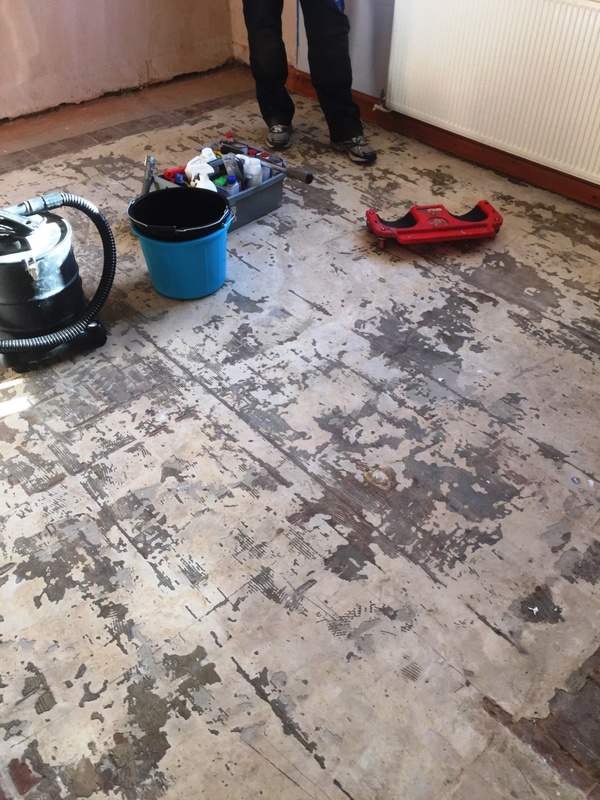 I started by carefully removing the Vinyl tiles using a hand scraper which as you can imagine was a lot of manual effort and the adhesive proved quite difficult to remove. In the end I had to use a combination of a very coarse 50 grit pad fitted to a heavy rotary machine lubricated with water, to clear the area completely of the substance. 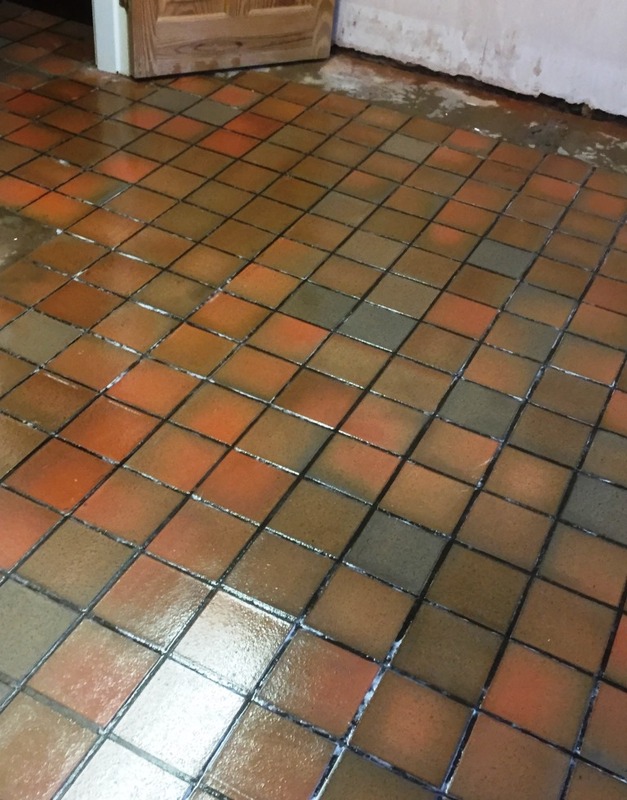 The resulting slurry was rinsed away, and the floor was then given a thorough acid rinse with Tile Doctor Grout Clean-Up. 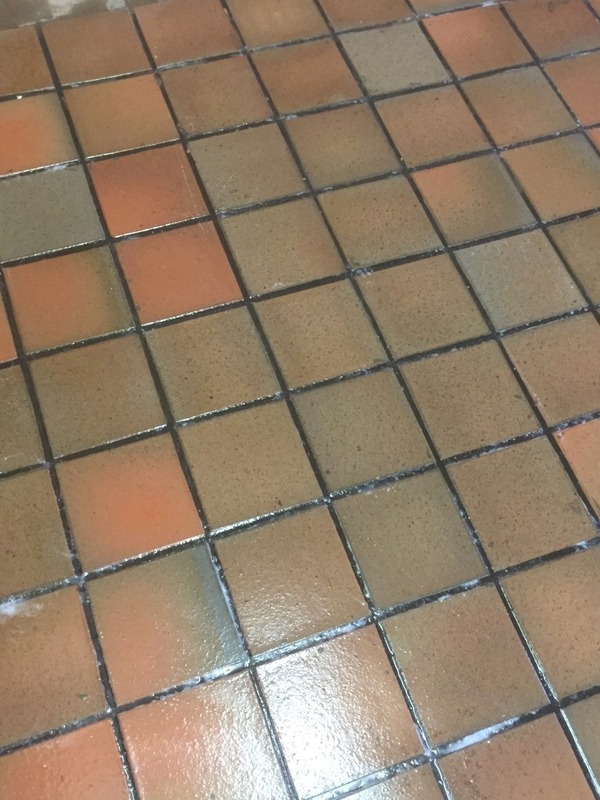 Grout Clean-Up is a cleaner which contains concentrated phosphoric acid, and is designed to dissolve minerals such as salts and cement left on the surface of the tile. This was followed by a final thorough rinse with water, and the excess moisture was soaked up with a wet-vac machine. After the cleaning process was complete, I left the floor to dry off completely for 24 hours. 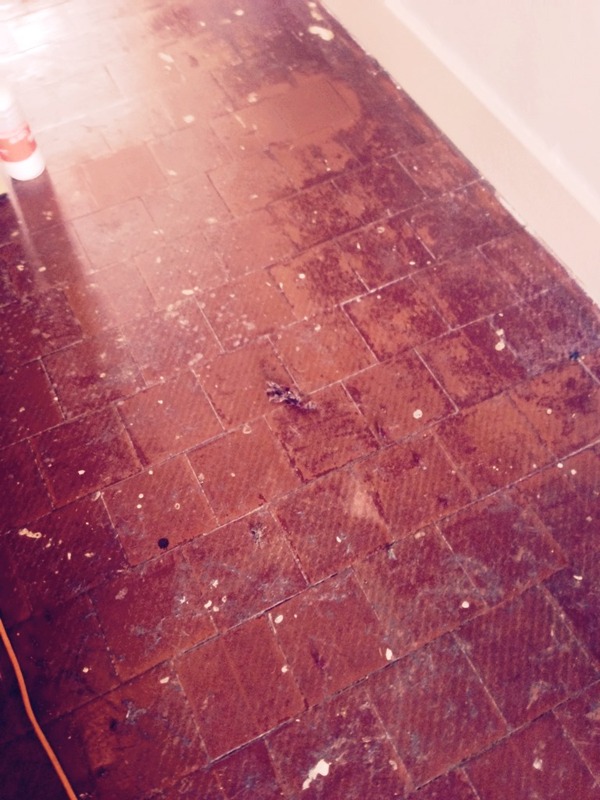 Upon my return to the house the next day, I checked for any dampness that could have damaged the performance of the sealer, thankfully, the floor was dry and ready to seal, and so I proceeded to apply several coats of Tile Doctor Seal & Go Extra. Seal & Go Extra is a fully breathable sealer that provides for effective moisture transmission. 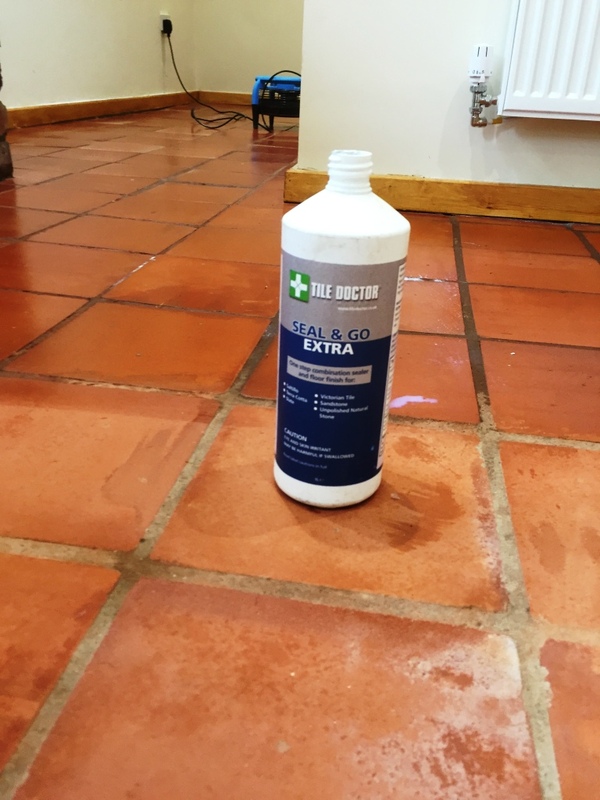 It provides durable surface protection against dirt and stains, and is suitable for most kinds of internal, natural stone tiled floors, including Quarry, Victorian and Flagstone. 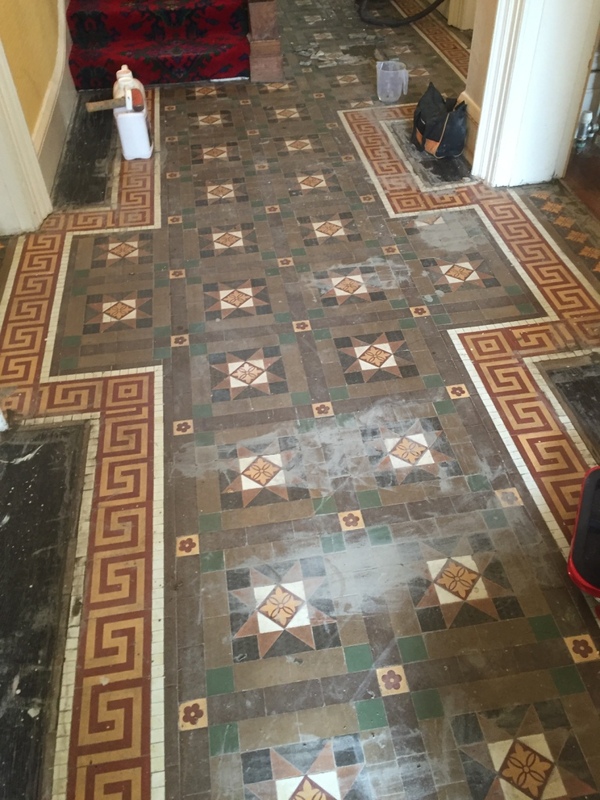 As you can see from the photographs the Quarry tiles came out really well and it’s hard to believe that this is the same floor. 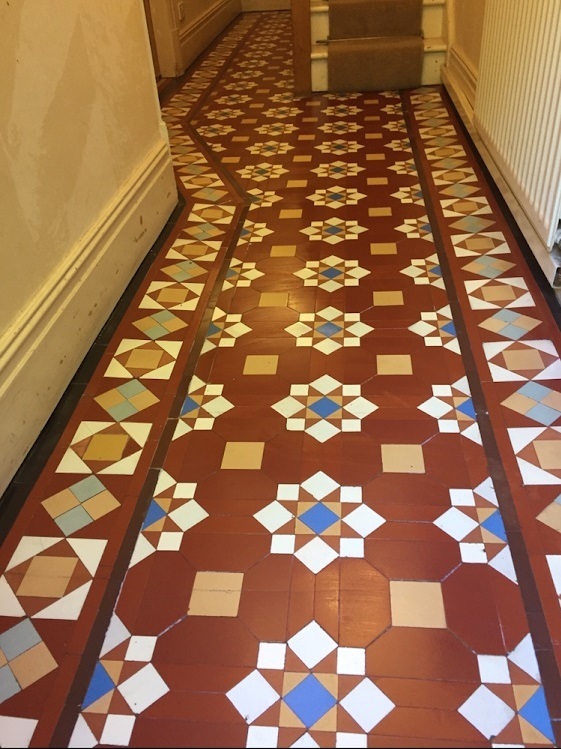 This Victorian tiled hallway at a house in Earlsdon near Coventry was not only in dire need of a good clean and seal, but also required some repairs to areas where the tiles were cracked or missing. The job took three days in total to complete, with one day spent on the necessary repairs, and two on the cleaning and sealing process. 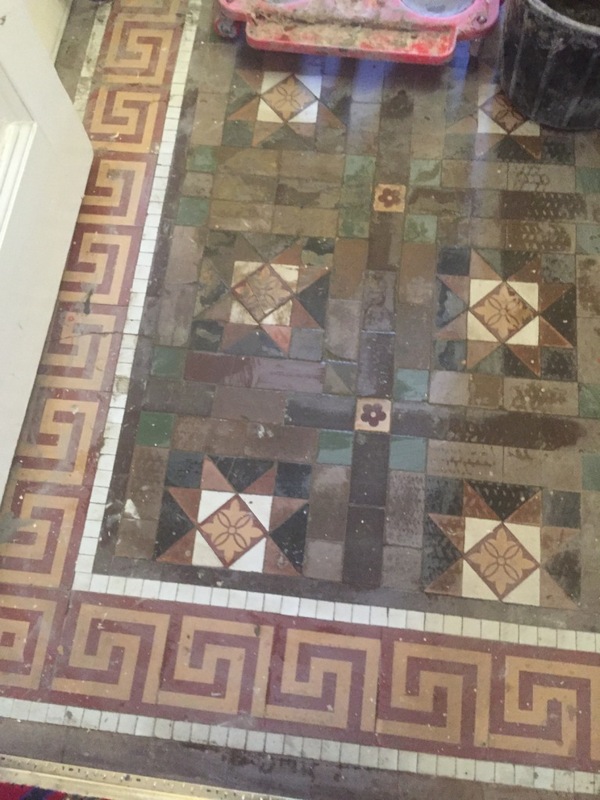 Repairing Victorian Tiles is generally a straightforward tiling job, complications that can arise are usually related to making sure the floor substrate is solid and sourcing matching tiles. 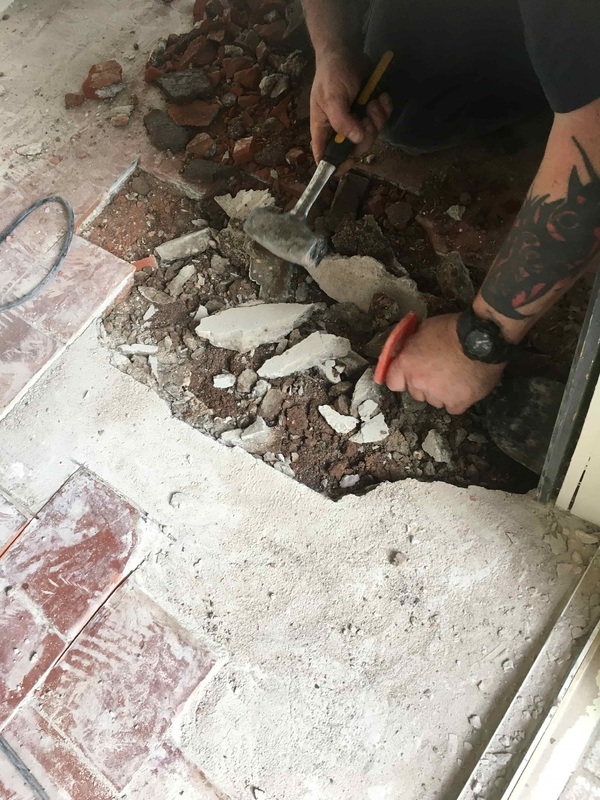 In this case the foundation was fine so it was just a case of scraping off the old adhesive and then re-fixing the tiles and re-grouting with a matching grout. 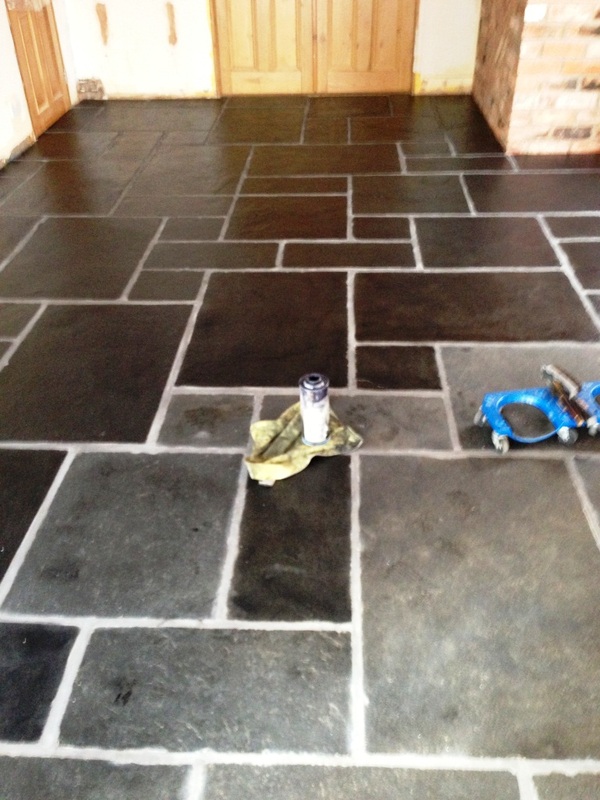 It’s best to do any repairs before cleaning and sealing as the new tiles will blend into the floor better. 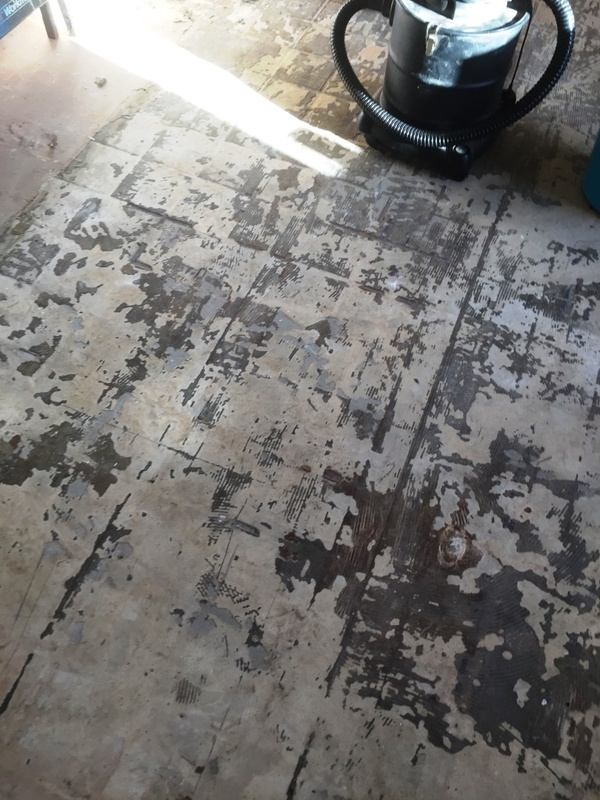 I left the floor to set overnight and then came back to clean the floor first applying a layer of Tile Doctor Remove & Go to floor in order to breakdown any old sealers, dirt and other contaminates such as paint and plaster from decorating. 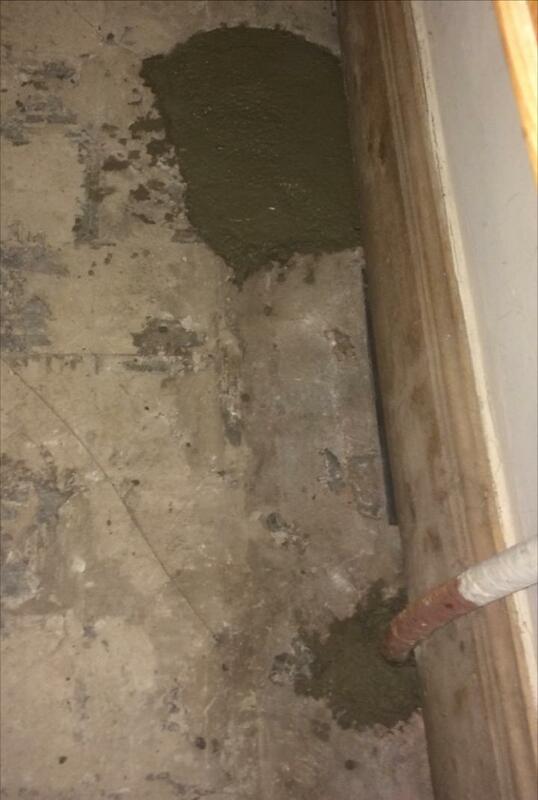 The product was left to dwell for ten minutes before being worked into the tile and grout using a black scrubbing pad fitted to a heavy rotary machine. 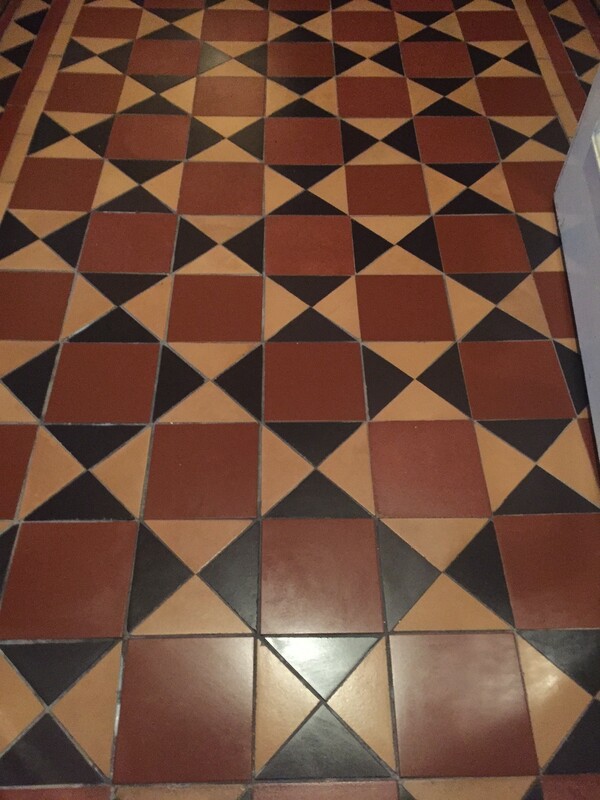 This made a marked difference in the appearance of the tiles and the resultant slurry was rinsed off the floor using water and a wet vacuum. Now the dirt was removed I could see there were some white salt deposits of the tile surface as well as smears of grout that were probably there since its installation. 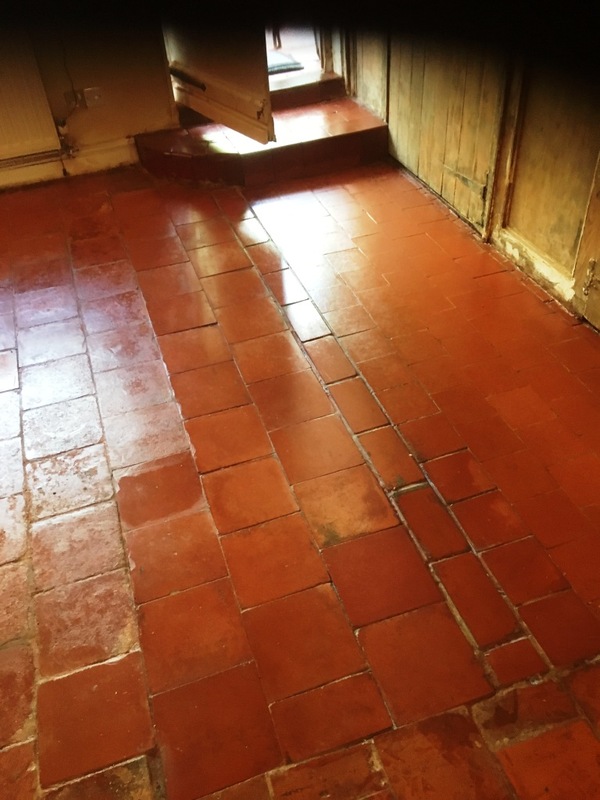 The mineral salt deposits often known as efflorescence are usually due to dampness rising up though the floor and these old Victorian floors rarely have a damp proof membrane which is a relatively new advancement. 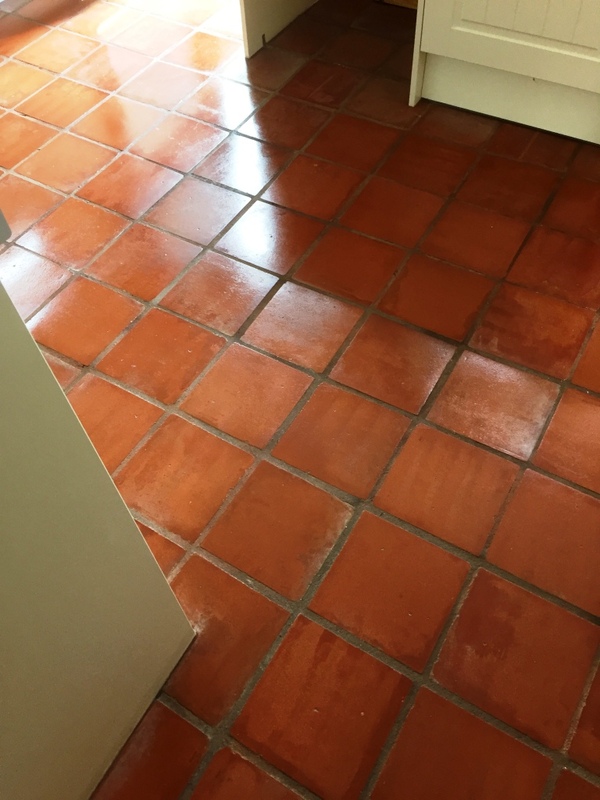 To resolve both these problems I applied Tile Doctor Acid Gel which is a blend of phosphoric and hydrochloric acids in a gel form so it doesn’t move around like a liquid. 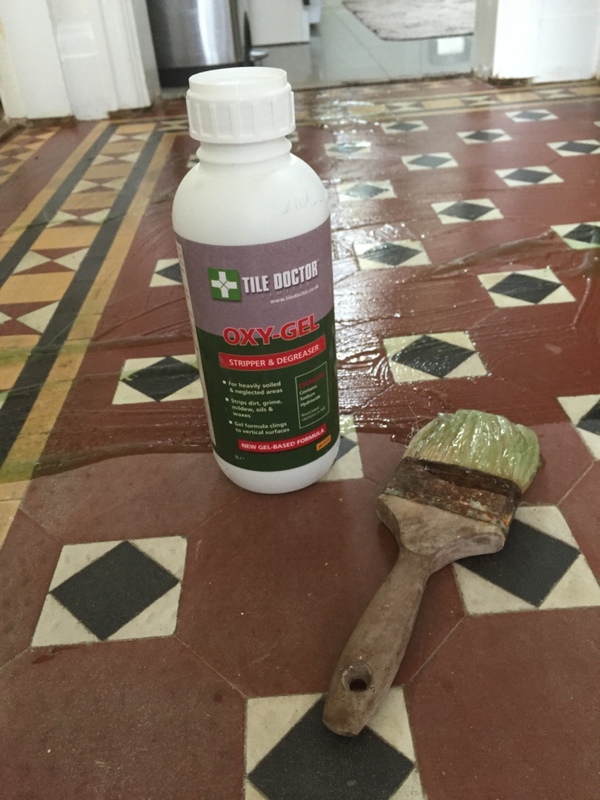 This product was especially effective on Victorian floor tiles, but should not be used on any tiles made of acid-sensitive stone, such as Marble or Limestone as it can damage them. Being an acid product it’s best not to leave it on too long either, so once I had managed to scrub off the efflorescence and grout smears I removed it and then gave the floor a good rinse to remove any trace and neutralise the floor prior to sealing. After completing the cleaning process, I left the floor to dry completely overnight and came back to the house the next day to finish off with a sealer. 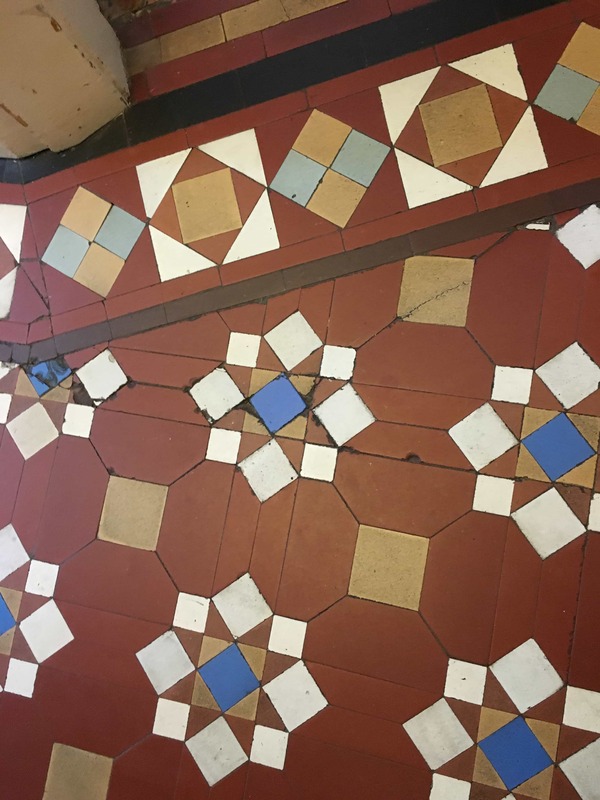 I usually seal Victorian and Quarry tiles with Tile Doctor Seal and Go however given the previous evidence of efflorescence I need to choose a sealer that was highly breathable. 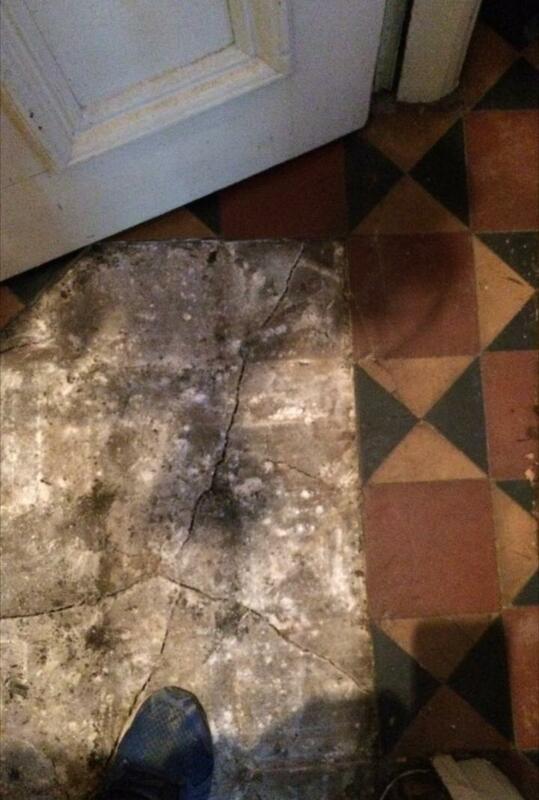 Fortunately Tile Doctor recognises this issue and has such a product called Seal & Go Extra. Not only does this sealer provides a stain resistant surface seal and a durable low-sheen finish it also has excellent moisture vapour transmission properties and can even be used externally. 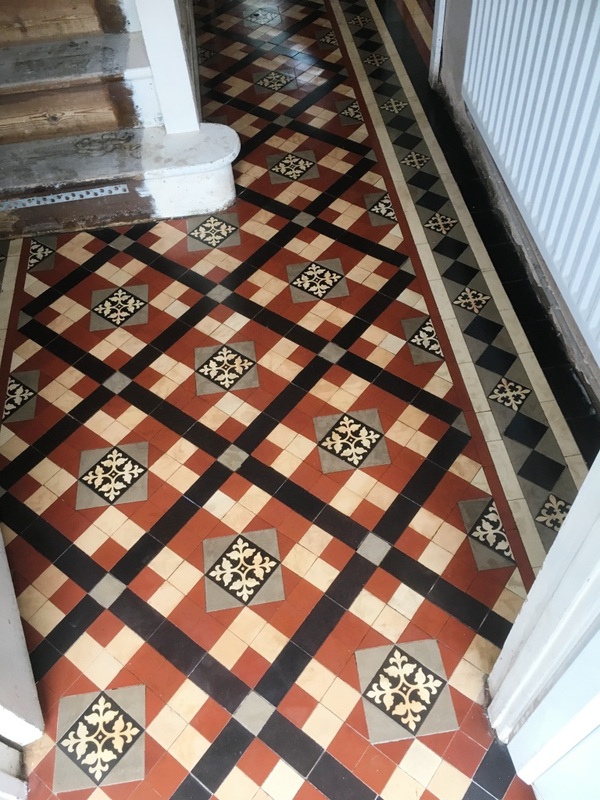 The before and after photos above really demonstrate the difference made to the appearance of this Victorian tiled hallway. 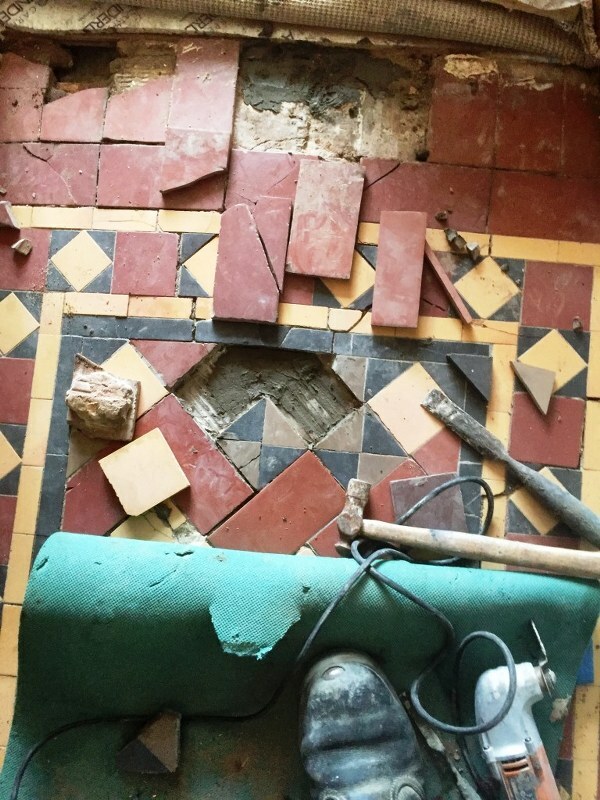 These beautiful Quarry tiled floors belong to a 13th century church in the heart of the old village of Frankton. 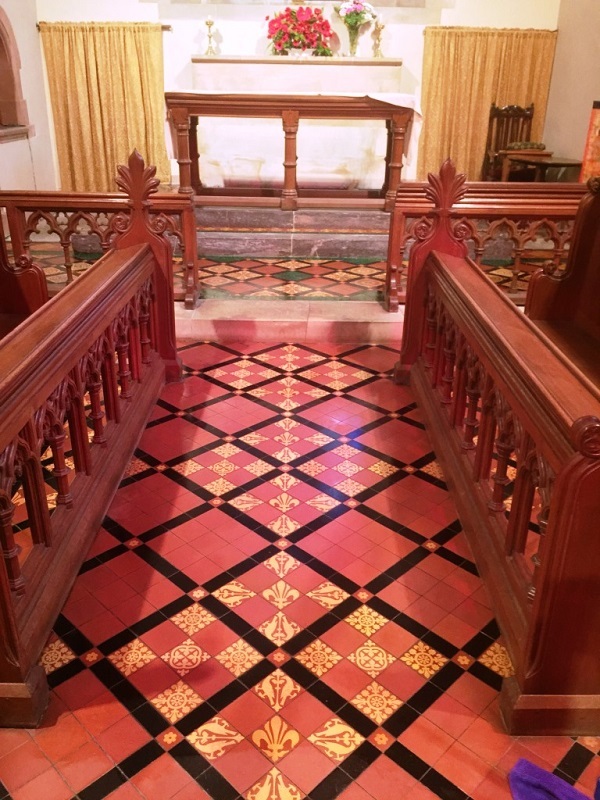 I did some research on the internet and discovered that the church had gone through a major restoration in 1872 so it’s most probable the tiles date back to that time. 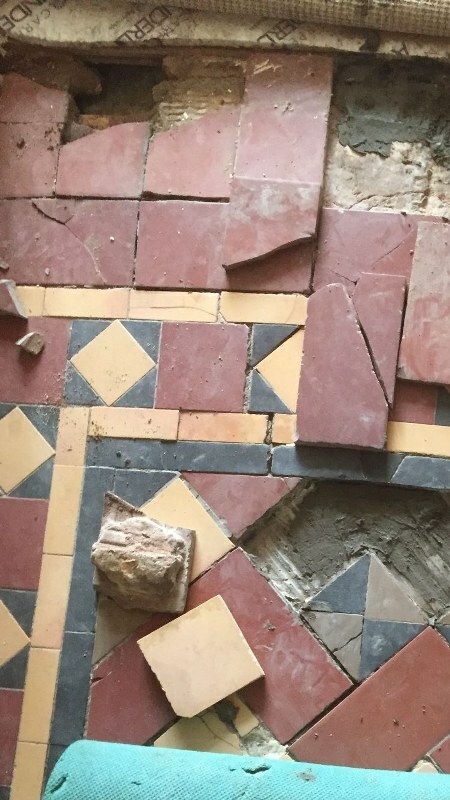 There were multiple quarry tiled floors that were all in need of a deep clean and seal; however there was concern that cleaning the tiles using conventional cleaning methods requiring a lot of water could result in damp permeating into the structure of the building and considering the age of the building may this could cause damage. With this in mind I ran some tests to work out an alternative and I worked out that the best alternative would be to use Acid Gel which would stay in place followed by a steam clean. There was quite a lot of floor to cover and I need to work in relatively small sections so it took two days to complete the cleaning. I used the method I worked out earlier applying Acid Gel, and then leaving it to dwell for ten minutes before working it in with a black scrubbing pad fitted to a buffing machine. The gel and resultant soil was then removed with a wet vacuum and then the section was steam cleaned to lift out any further dirt and neutralise the acid. 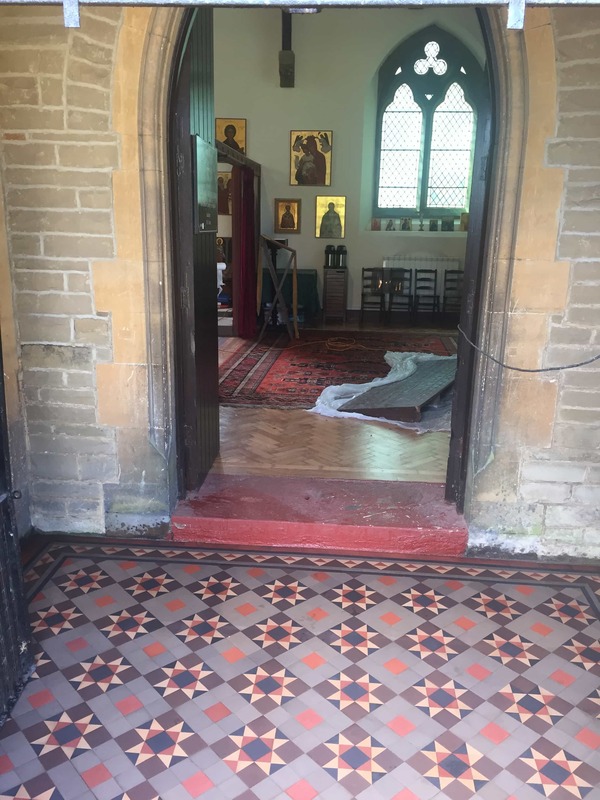 On the third day I returned to seal the floors; there are a number of sealers I could have used for this type of floor however with the building being as old as it was I wanted to ensure the tiles could breathe and any damp could rise up through the tiles. 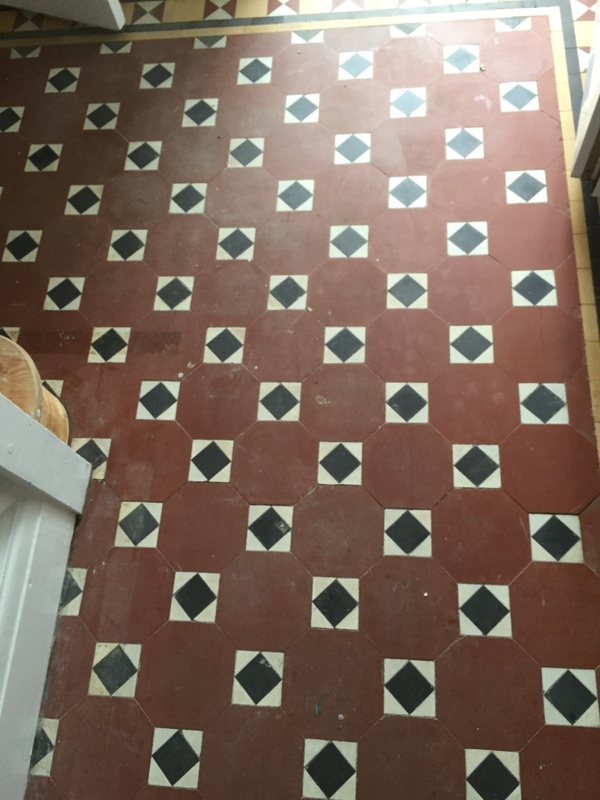 Additionally I wanted the sealer to bring out the best in the tiles so with these points in mind I sealed the floor using four coats of Tile Doctor Seal and Go extra which covers all these points and is the recommended sealer for Victorian and Quarry tiles. 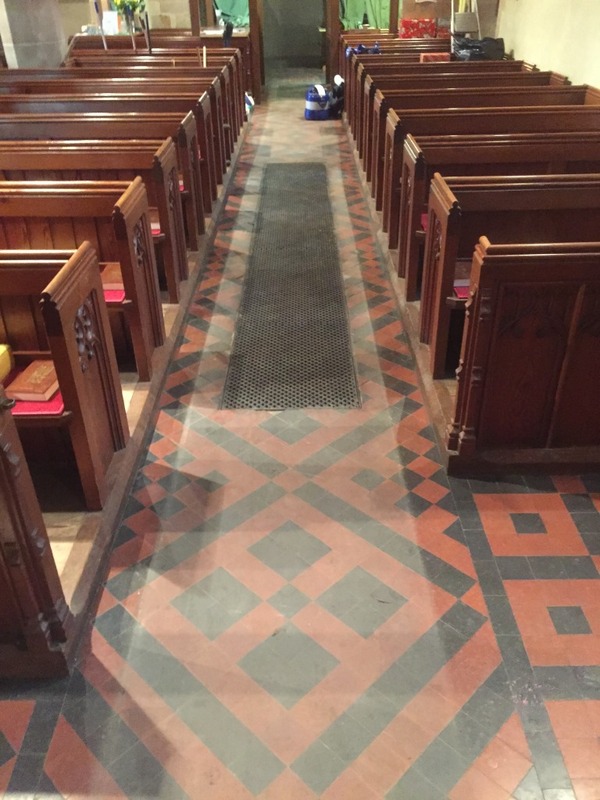 I think you will agree the floors now look fantastic and with the sealer to protect them they should stay this way for some time to come, although give the amount of traffic these floors receive I will be working out a maintenance plan for them. 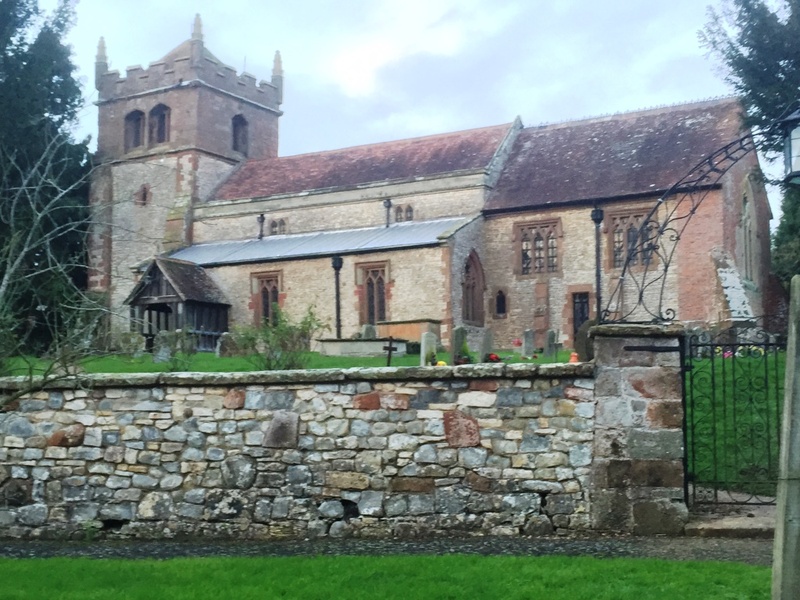 Recently I was called to a house in the very small town of Marton in Warwickshire which is known for its proximity to the medieval “Marton Bridge”, which lies just to the north, crossing the River Leam. 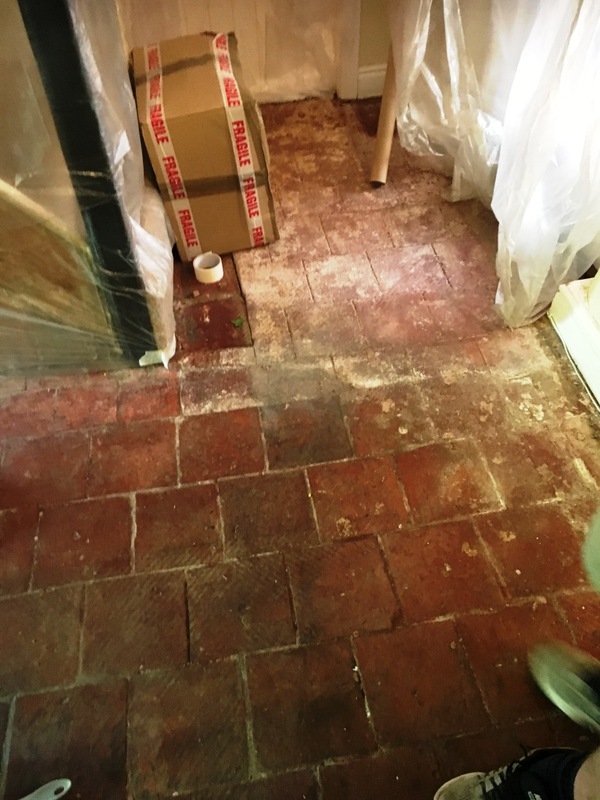 The entire downstairs flooring of my client’s house consisted of Quarry tiles apart from one room where the tiles had been covered by screed and then linoleum. 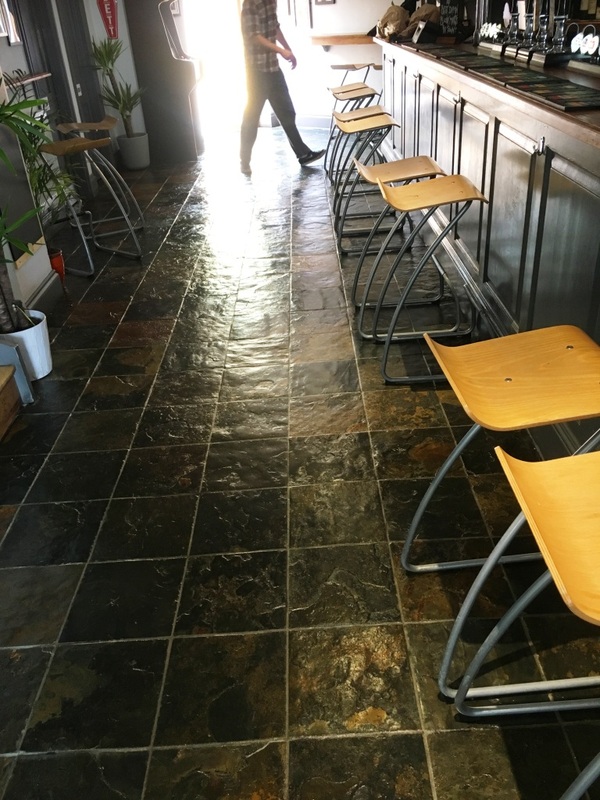 Quarry tiles are a classic hard wearing tile used for both internal and external commercial and residential flooring due to its ability to withstand heavy usage. 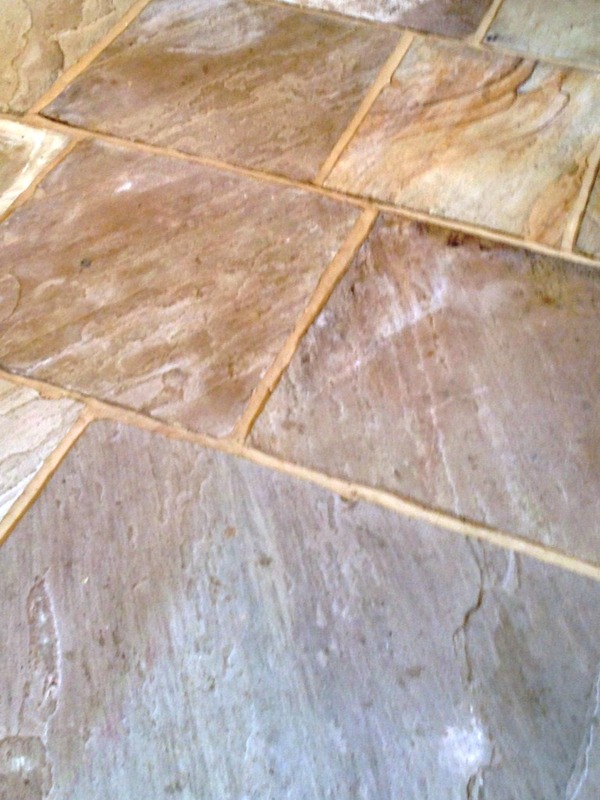 Reception areas, outdoor patios and porches, for example, are commonly tiled using Quarry. 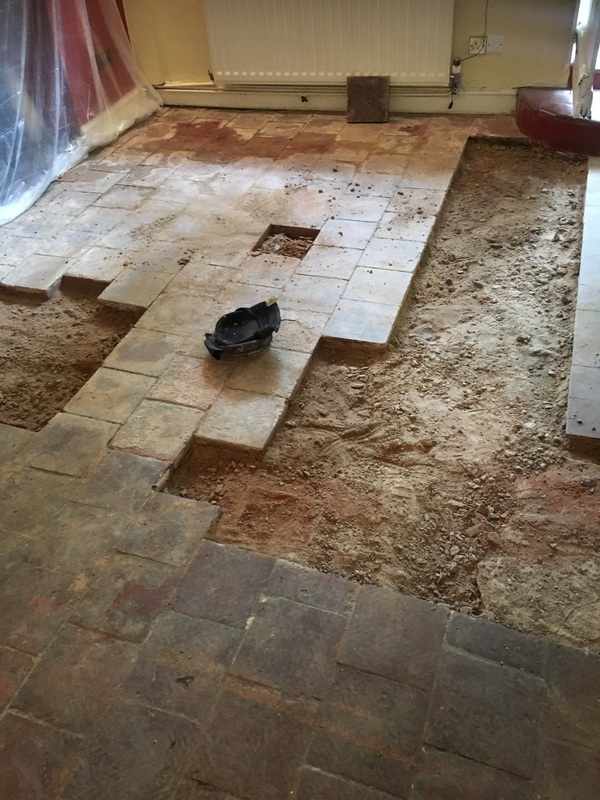 My client wanted to restore the covered floor back to its original state so that it would match the rest of the downstairs. 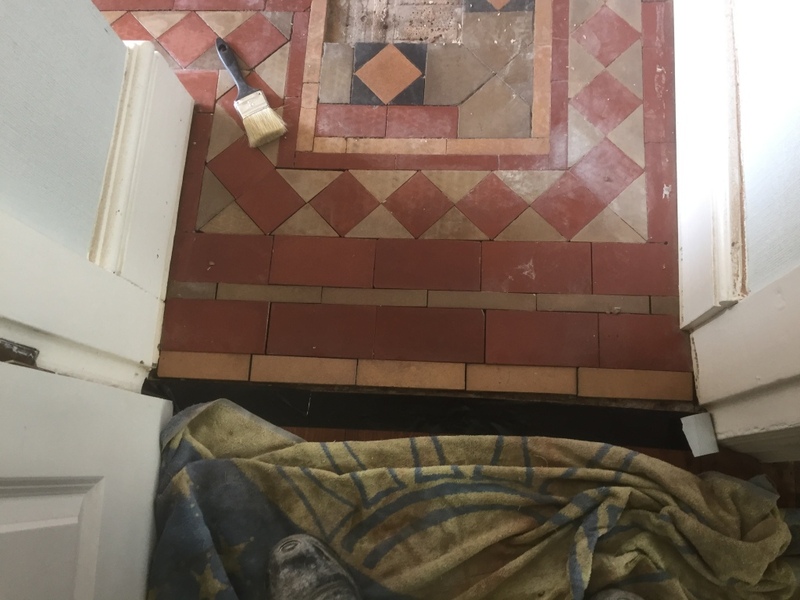 Realising that this would be a complex and physically demanding task, my client decided to call in Tile Doctor to carry out the restoration. 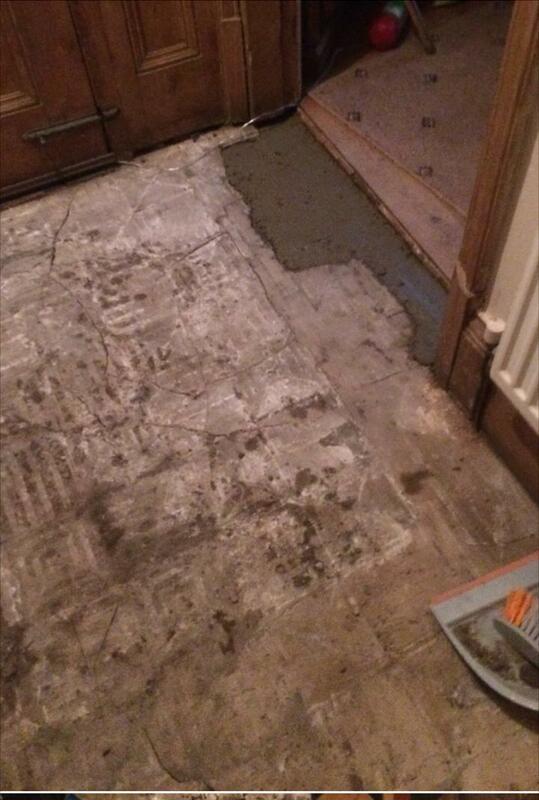 Removing the Linoleum covering was a relatively straightforward process, so I was able to do this relatively quickly. The main issue concerned removing the screed, which is far more difficult to remove, requiring a lot of physical scraping. 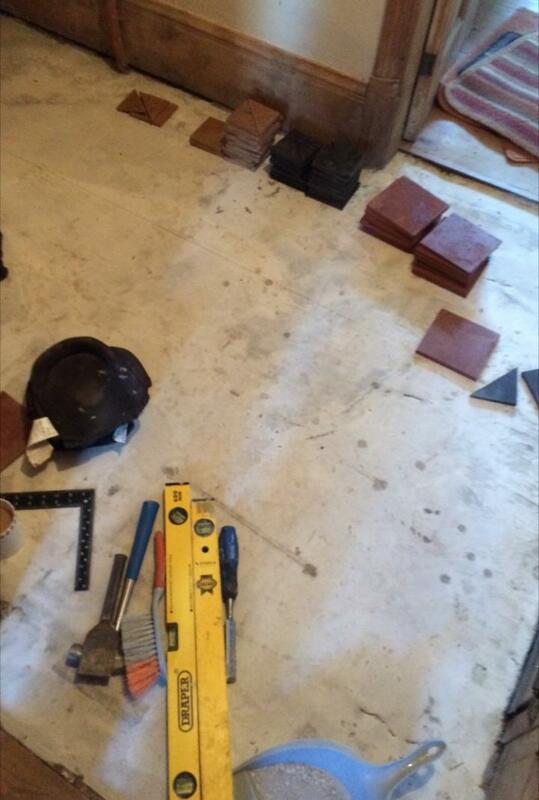 Thus I opted to call in some extra manpower in the form of the Nottinghamshire Tile Doctor, Steve Carpenter. With the two of us armed with scrapers we set about removing the screed, taking extra care not to damage the Quarry tile underneath. 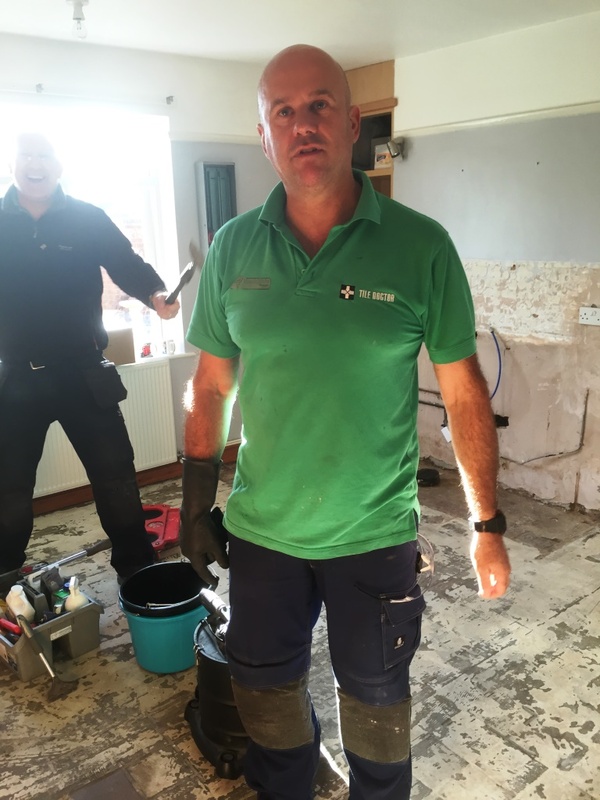 Once Steve and I had scraped off as much of the screed as physically possible, I applied a strong dilution of Tile Doctor Remove & Go, a stripper with cleaning properties that is particularly effective at breaking down coatings such as adhesives, plasters and sealers. The product was left to dwell for ten minutes before I worked it into the stone with a scrubbing pad. 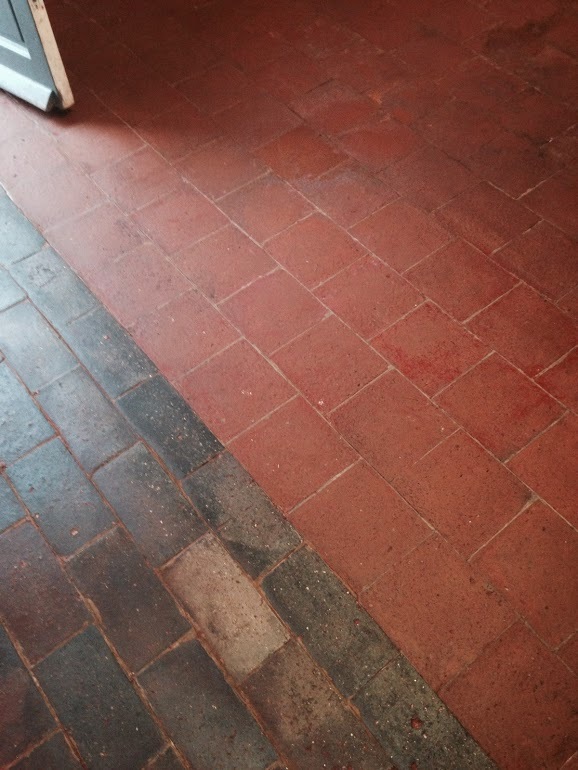 After cleaning the tiles, I noticed a layer of grout haze on the surface of the exposed Quarry tiles, so I applied Tile Doctor Grout Clean-Up to remove it. Once the cleaning process was complete I gave the floor a thorough rinse with clean water, before soaking up the resulting residue with a wet-vac machine. The first day of work was a gruelling 12 hours long, but I was very pleased with the results and left the floor to dry overnight. 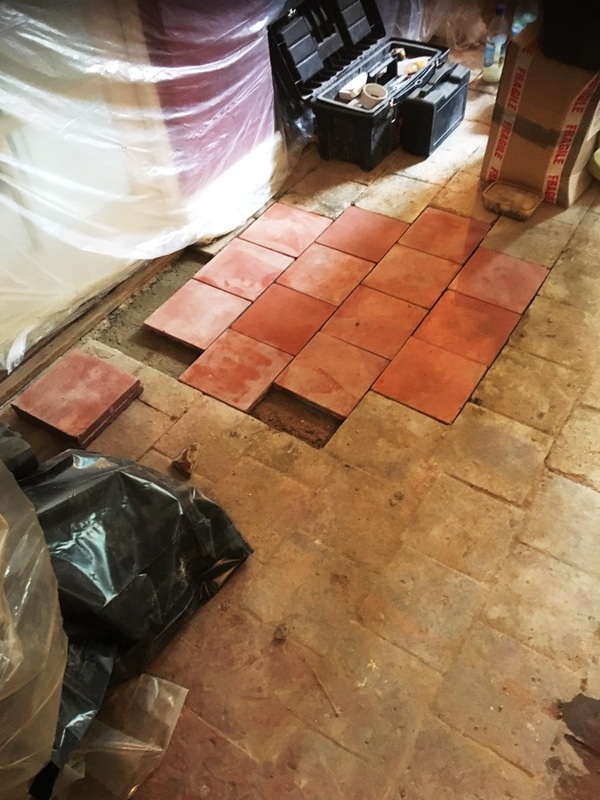 On day two I returned to finish the job by sealing the newly uncovered Quarry tiles, but not before using a damp meter to check that they were completely dry. 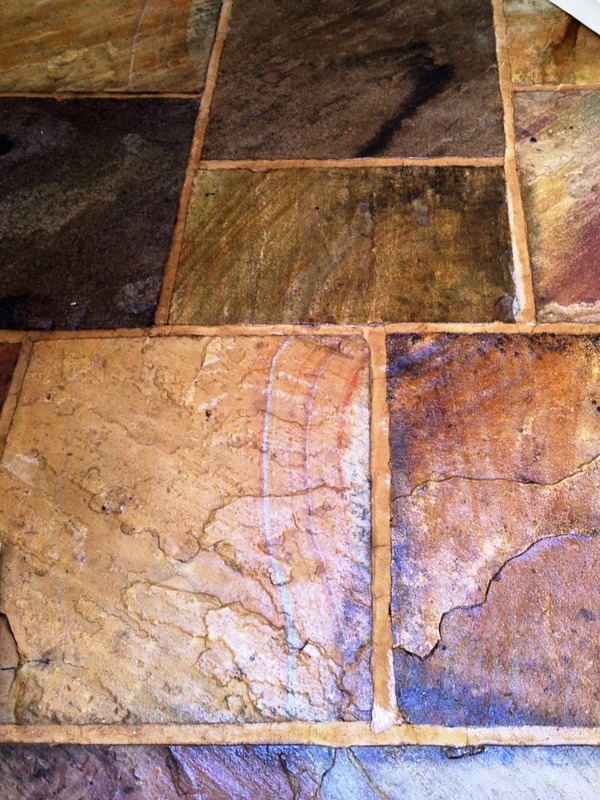 Any excess moisture left on unsealed tiles can potentially effect the performance of any sealers that are applied. 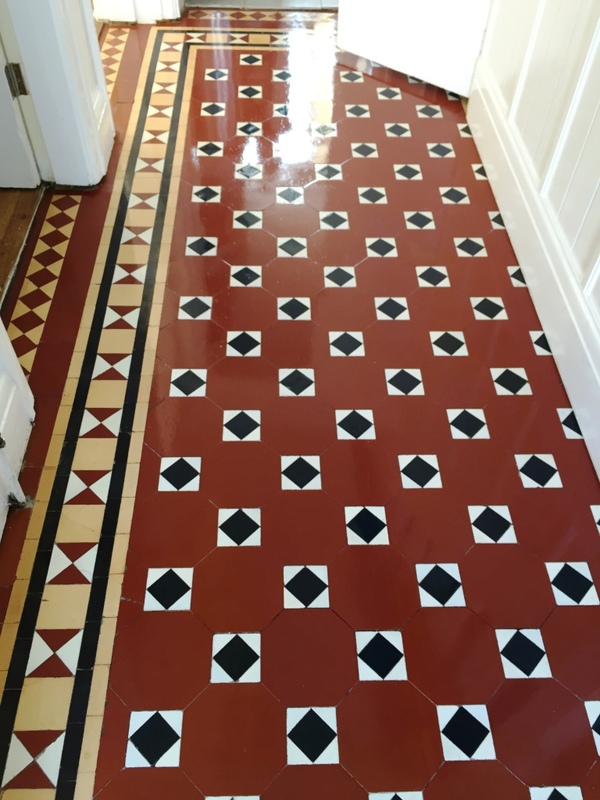 I sealed the tiles using Tile Doctor Colour Grow, an impregnating, colour-enhancing sealer which gave the surface an aesthetically pleasing shine, as well as durable protection against dirt and wear for the future. 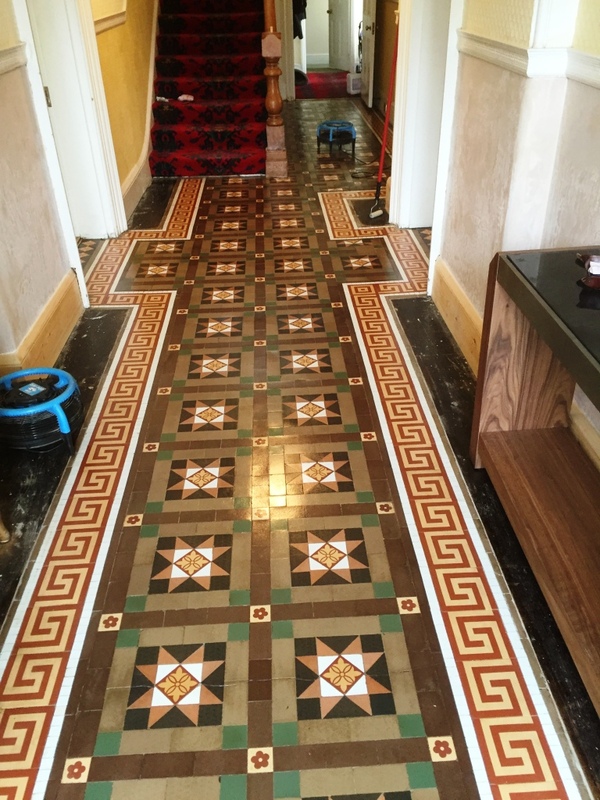 After two long days of work the job was done and the transformation was fantastic and highly rewarding to see, the house now has a fantastic looking Quarry tiled floor running throughout the entirety of the lower level. 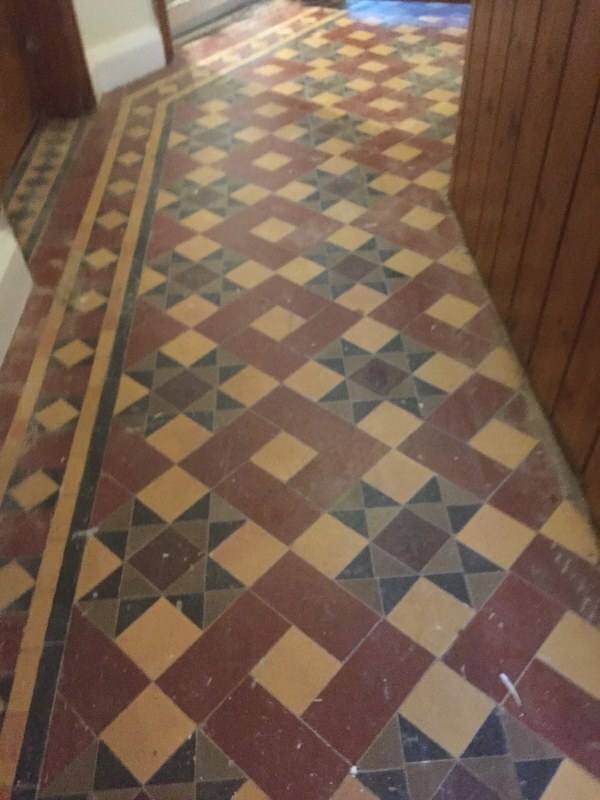 Located in the hallway of an old vicarage in the historic town of Stratford upon Avon these Quarry tiles had been hidden under carpet for many years and before that it appears had been painted in red brick paint and splattered with plaster and paint from decorating. 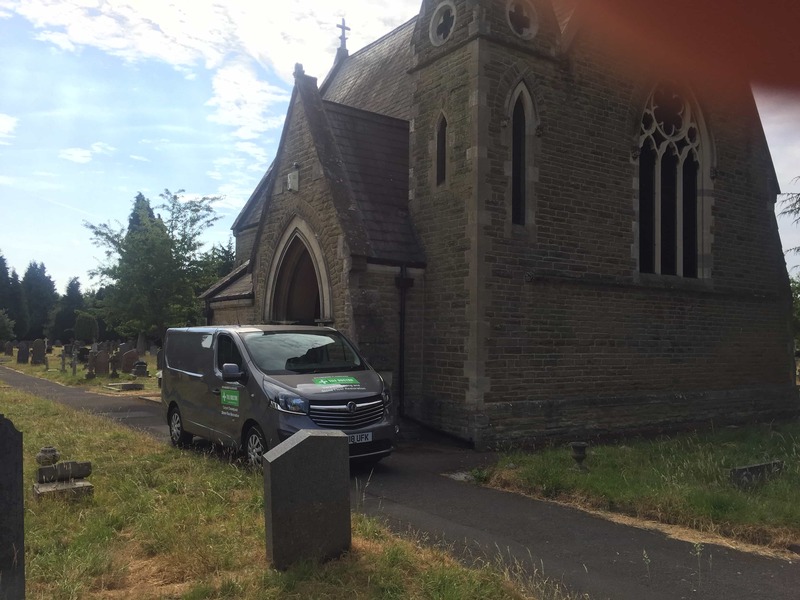 I was asked if there was anything we could do to restore them and having done a number of these types of renovations before I was confident that would could and got the go ahead to proceed. 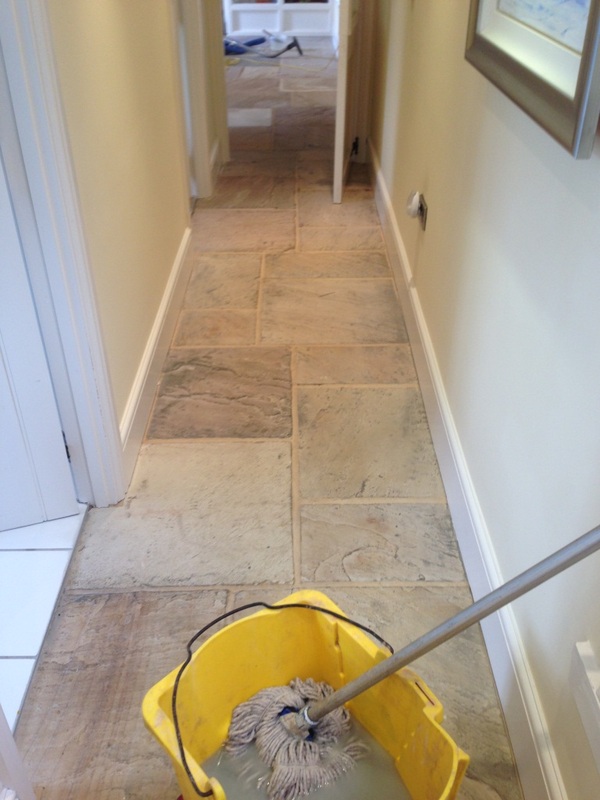 The first job was to give the floor a really good deep clean and to remove any coatings from the tiles. 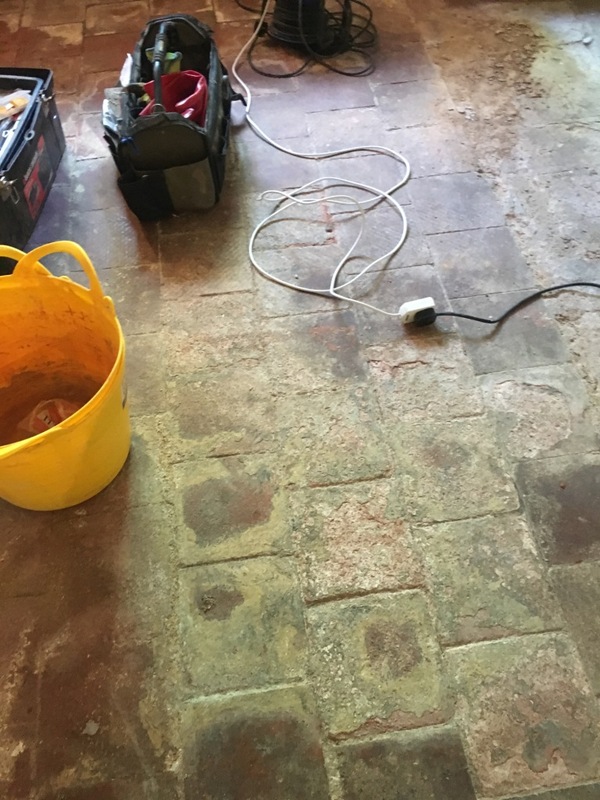 To do this a strong dilution of Tile Doctor Remove and Go was left to soak into the floor for about 30 minutes before being scrubbed in using a slow speed rotary machine fitted with a scrubbing pad. 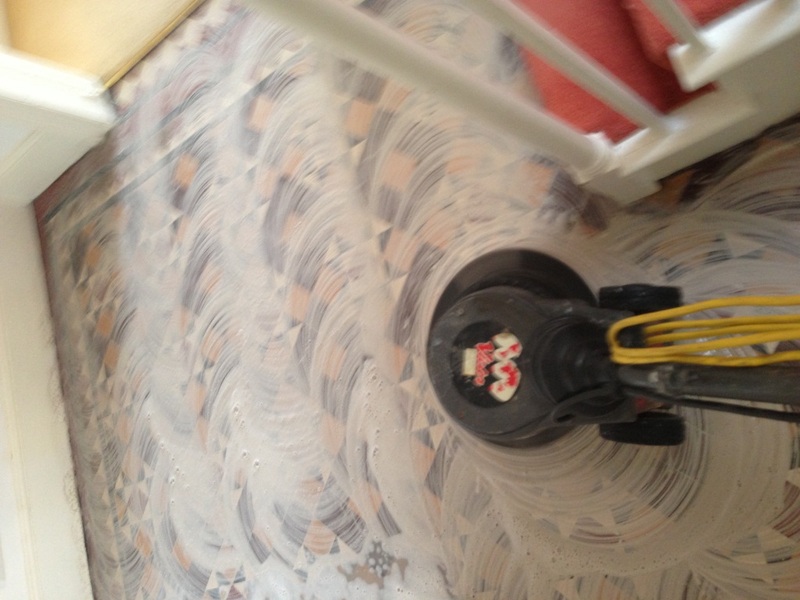 I then used a wet vacuum to remove the resultant soiled solution and rinsed the floor down with water. There were quite a few stubborn areas and so the whole process had to be repeated, additionally some of the paint needed to carefully removed using a scraper. Once the floor was clean I gave it a wash with Tile Doctor Grout Clean-up which is an acid based product that will remove light grout smears and mineral deposits from effloresce which can leave to white salt deposits appearing on the tile surface and can be quite common on old tiled floors that have no damp proof course. The cleaning process took up the whole day and after finishing the whole floor was given a thorough rinse with water to ensure no trace of cleaning product remained on the floor. 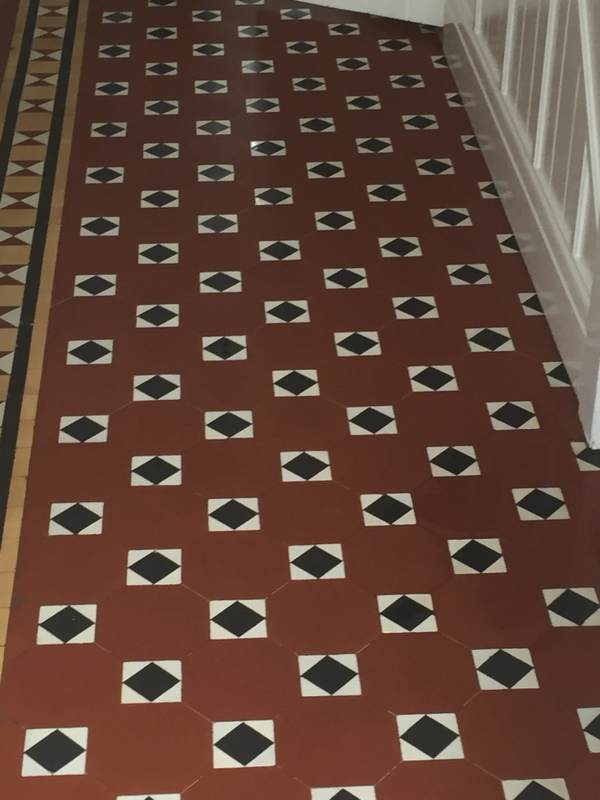 Details below of a Quarry tiled floor that we treated in Long Itchington which had previously been painted with an epoxy paint designed for garage floors. 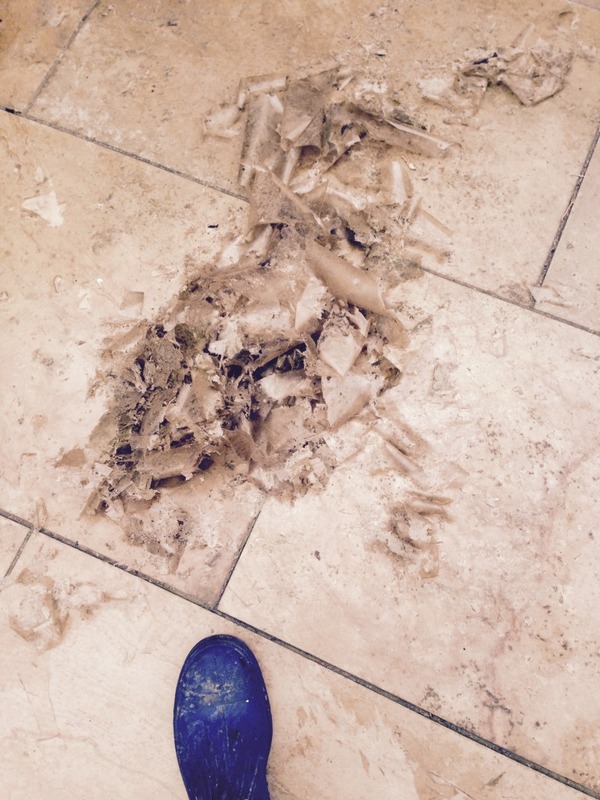 Not the best product for maintaining the natural look of Quarry Tiles. To get the paint off the floor had to be soaked in a dilution of Tile Doctor Remove and Go which is a coatings remove and can pretty much remove anything from tiles. 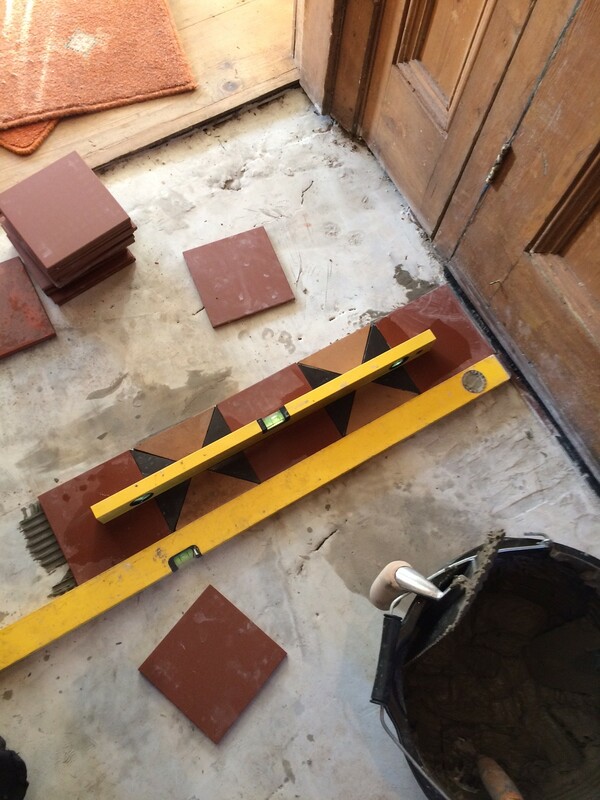 This was left to work on the tile before being scrubbed in using a rotary machine fitted with a black scrubbing pad. The grout also needed attention and this was also scrubbed this time by hand using a stiff brush along the grout line and more Remove and Go. The resultant soiled solution was removed using a wet vacuum and the floor washed down. 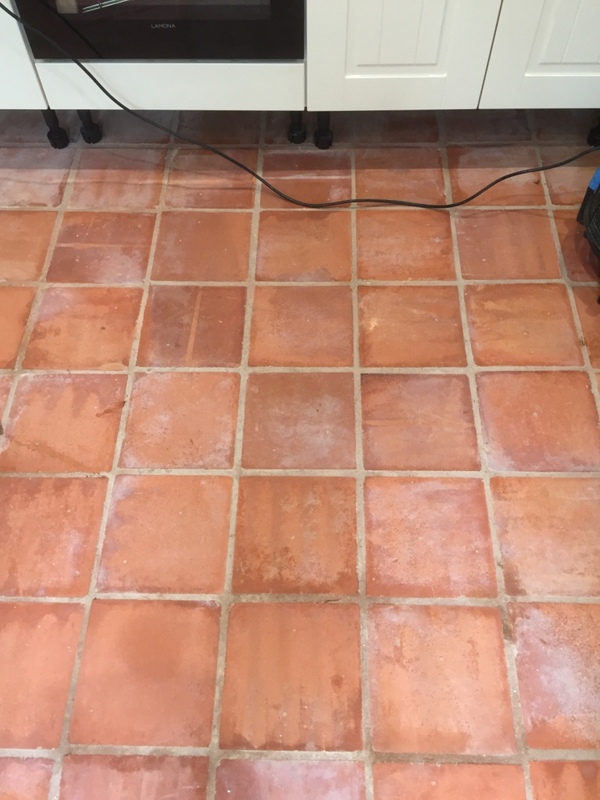 There were some stubborn stains so further work continued this time using Tile Doctor Grout Clean-up which is a stronger acid based product ideal for removing grout smears from tile, paint and even rust. 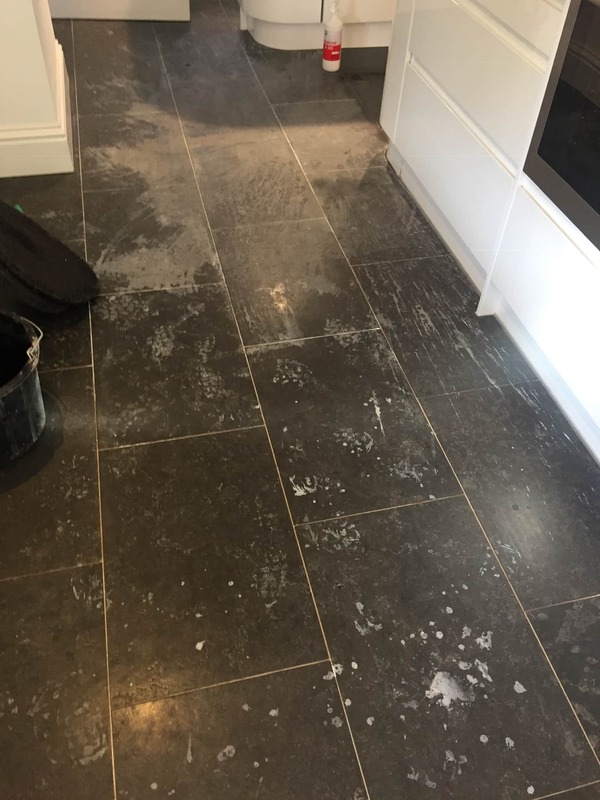 Following this the solution was removed as before and the tiles given a thorough rinse to ensure no products were left on the floor and then left to dry overnight. 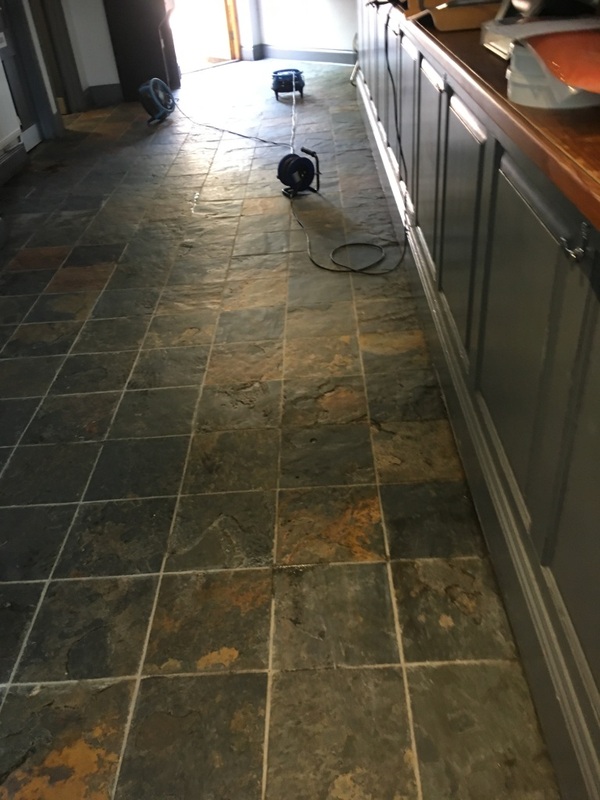 The floor had dried when we returned the next day so we set about sealing it using three coats of Tile Doctor Colour Grow which provides surface stain protection to the quarry tile and grout and also has a special formula that brings out the colour in the tile. Following on from a referral I agreed to travel down to Stratford upon Avon and deep clean this Travertine tiled floor which had not been professionally cleaned for over eight years and was now looking rather dull as you can see in the photograph below, additionally the holes in the travertine had not been filled and was allowing dirt to get trapped into the tile. 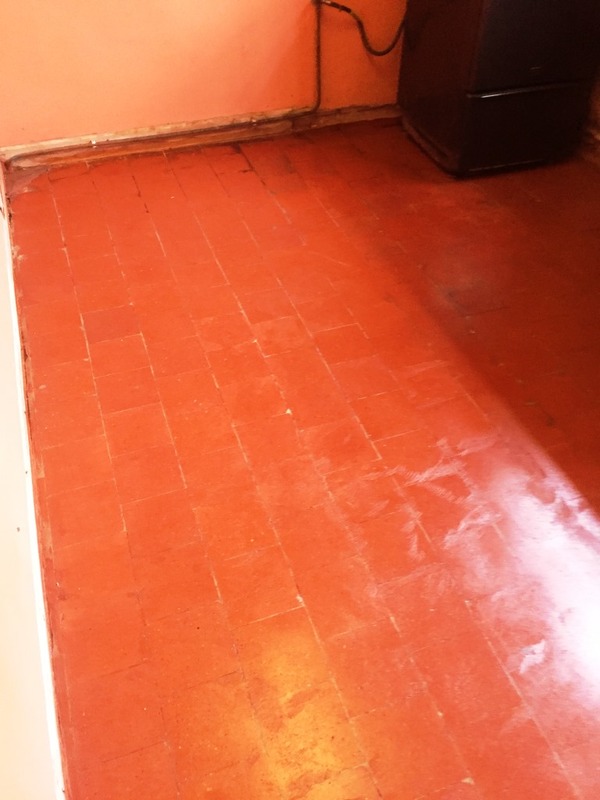 The first job was to wash the floor down with Pro-Clean to give it a general clean and remove any surface dirt and grit from the floor and then fill the holes with a colour matching grout; there were quite a few holes to fill so this task took some time to complete. 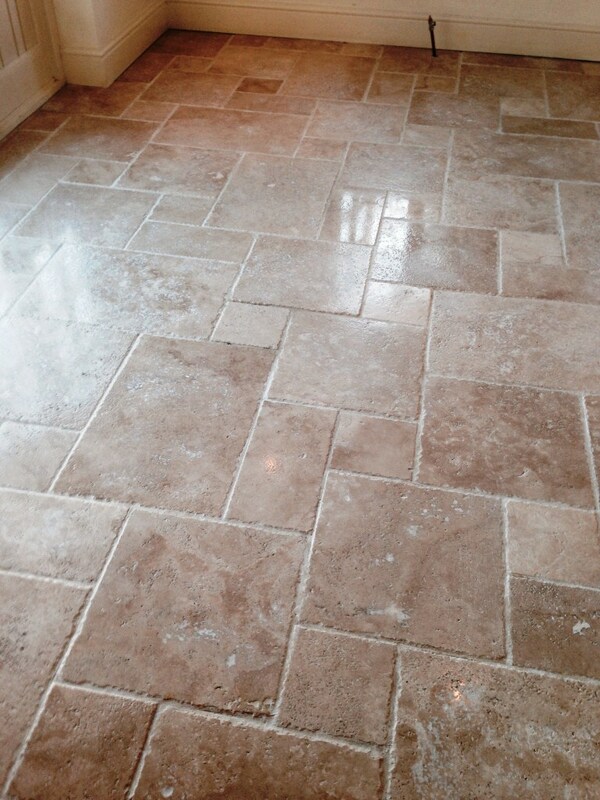 Polished Travertine is a very hard stone so restore its finish it needs to be cut back and polished using of a set of diamond encrusted burnishing pads fitted to a rotary machine. You start with a coarse pad with a little water, then a medium pad, fine pad and finish with a very fine polishing pad, this takes some time but the effect it quite transforming, it does build up slurry on the floor so it all needs to be washed down again at the end. 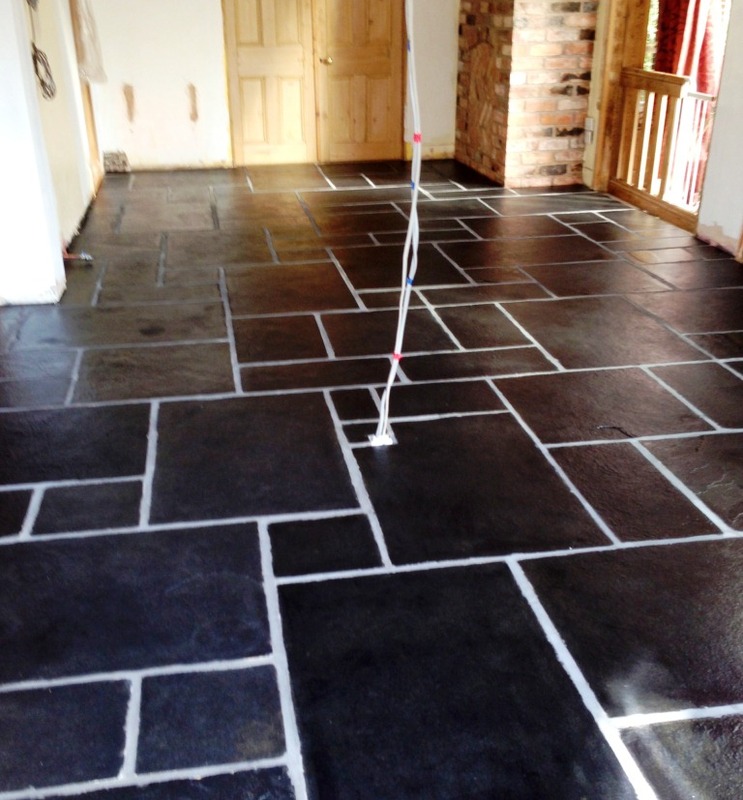 To keep the floor looking good for longer and protect it from stains it does need to be sealed so once it was dry it was sealed using two coats of Tile Doctor Colour Grow which is a colour enhancing sealer that brings out the colours in natural stone. Then once the sealer was dry it was buffed using a white buffing pad to make sure that I hadn’t left any residues from the seal. The job took three days to complete in total and I think you will agree it’s now looking much healthier. 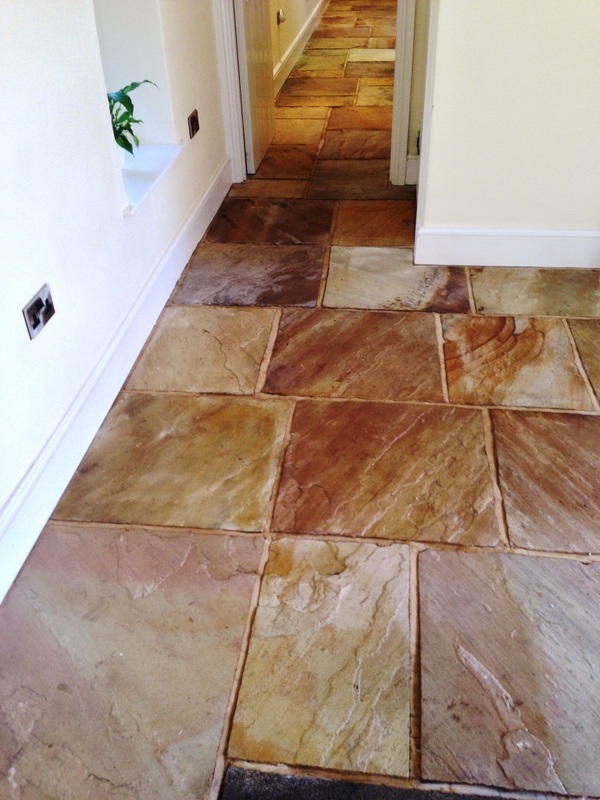 These Sandstone flagstones were in the hallway of a house in the 16th century village of Stretton under Fosse, Warwickshire. 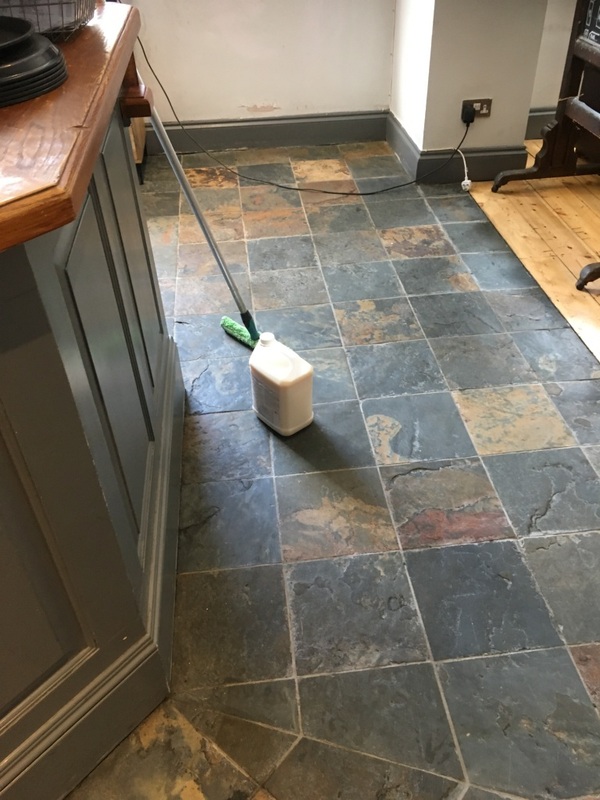 The flagstone floor was in good condition however it had never been sealed so every time it was cleaned the cleaning product soaked into the floor and was less effective also the customer wanted to reveal the natural colours in the Sandstone and needed some of the grout repairing. 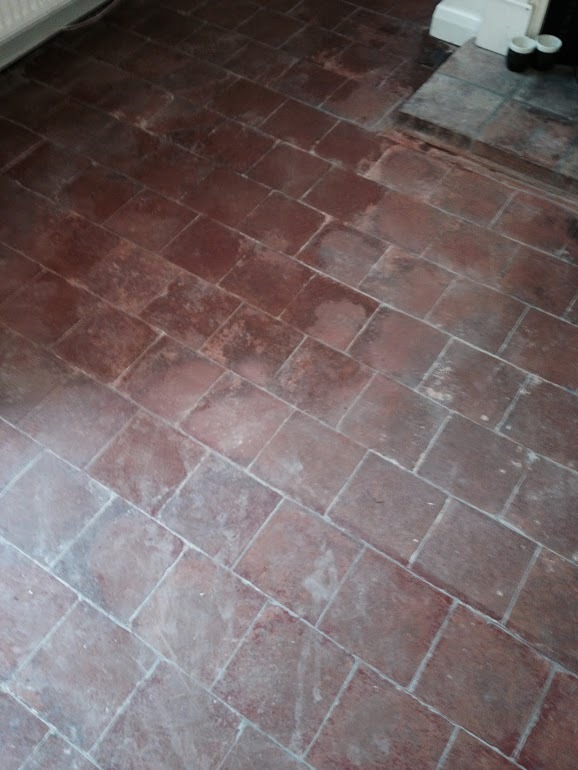 The first job was to clean and flush the flagstone so we set about cleaning the stone using Tile Doctor Pro-Clean mixed 50/50 with NanoTech Ultra-Clean and further diluted with water. I often use this combination, Pro-Clean is a strong and effective alkaline cleaner whilst NantoTech adds tiny abrasive particles that assist and speed up the cleaning process. 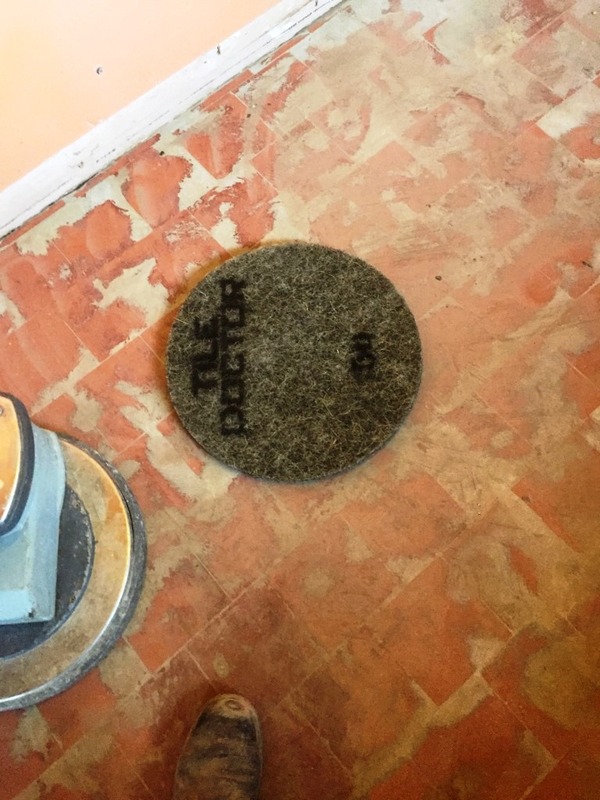 The solution was applied using a mop and then worked into the floor using a rotary buffing machine fitted with a black 17” scrubbing pad. The soiled cleaning solution was then picked up off the floor using a wet and dry vacuum and the floor was given a thorough wash down with clean water to remove a trace of cleaning products that may impact the sealer. 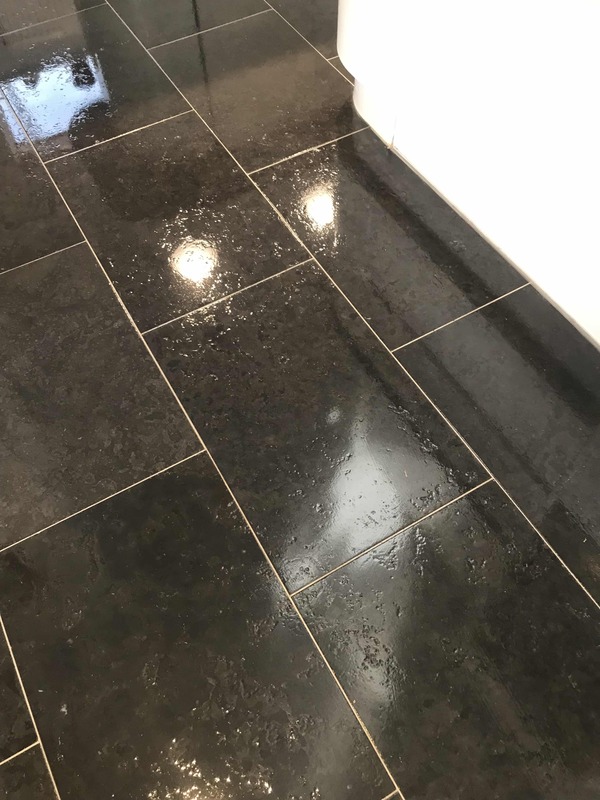 There were a few areas of grout that had cracked and become lose so we set about replacing the grout with a closer match as possible and then left for the day to allow the floor to try overnight. 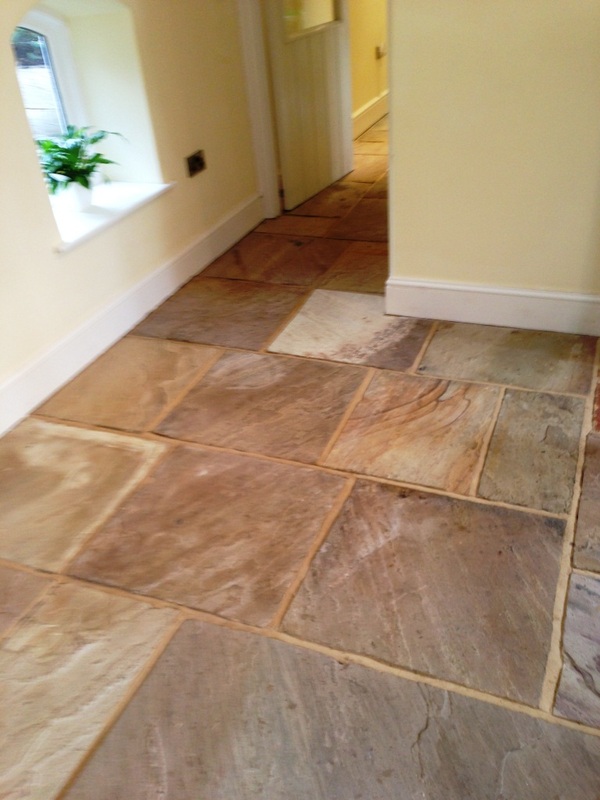 We sealed the Sandstone flagstones with a single coat of Tile Doctor Colour Grow, there are a number of sealers we could of used for this floor all have different effects and differing levels of stain protection against spills but Colour Grow is really durable and helps to bring out the deep colour from within the stone . 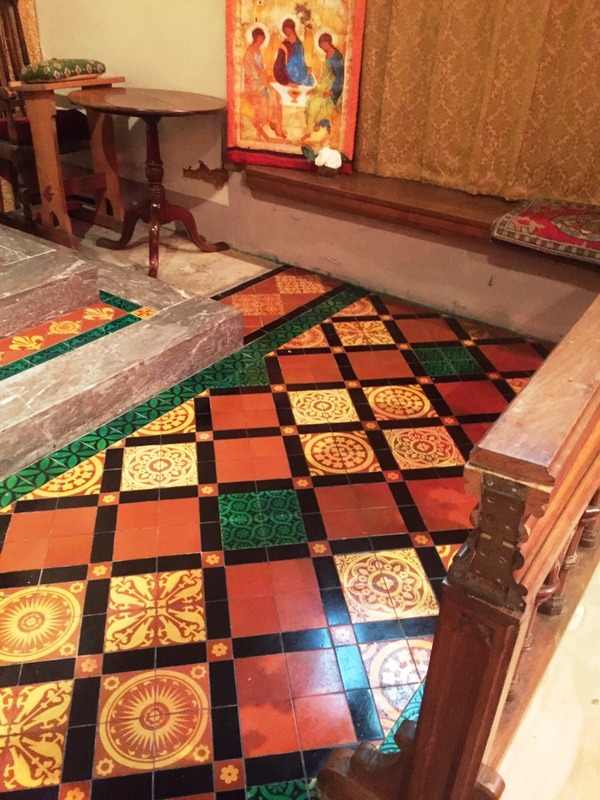 To finish and build up the lustre and richness of the colour we then applied seven coats of Seal & Go which add a nice low sheen to the surface of the tile.